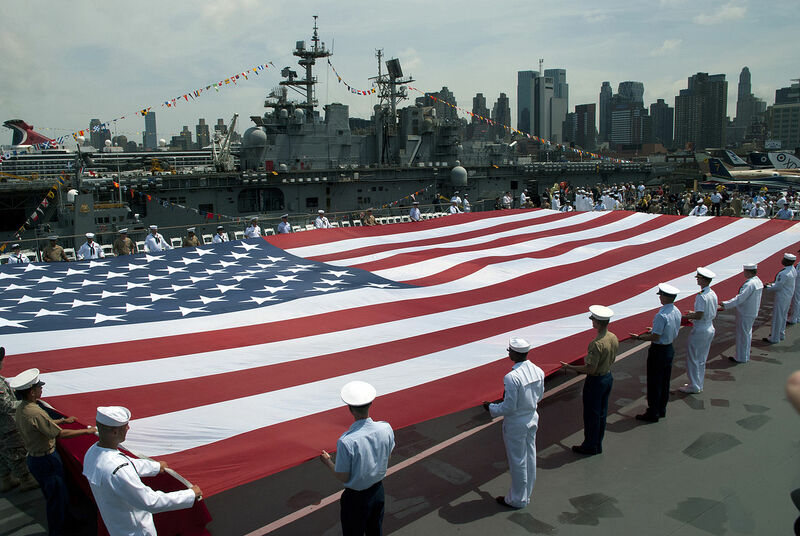 May 2011: U.S. Navy, United States Marine Corps and U.S. Coast Guard personnel unfurl an American flag on the flight deck of the Intrepid Sea, Air & Space Museum at a Memorial Day ceremony during Fleet Week New York. Fleet Week has been New York City’s celebration of the sea services since 1984 and is an opportunity for citizens of New York and the surrounding area to meet Sailors, Marines and Coast Guardsmen and see firsthand the capabilities of today’s maritime services. Photo by Petty Officer 2nd Class Matthew R. White. Honoring the deceased is a centuries-old practice that includes many traditions across cultures. 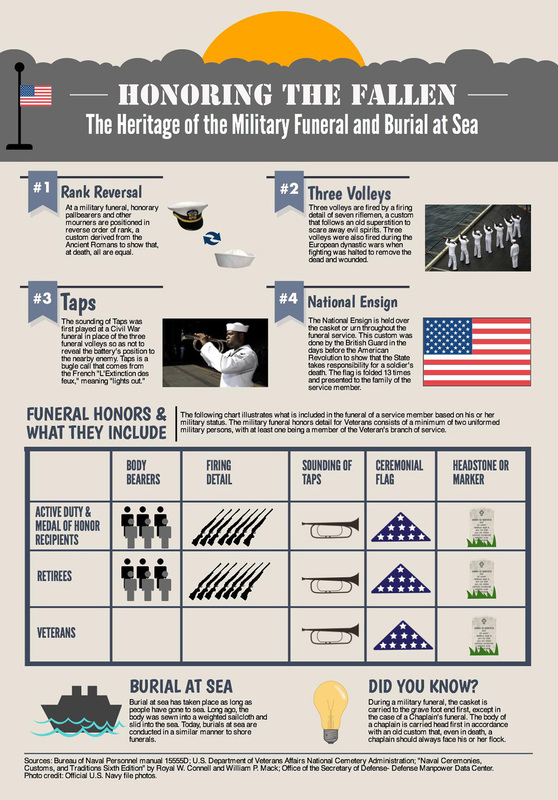 The customs and traditions behind military funerals and burial at sea date as far back as ancient Greece and Rome. 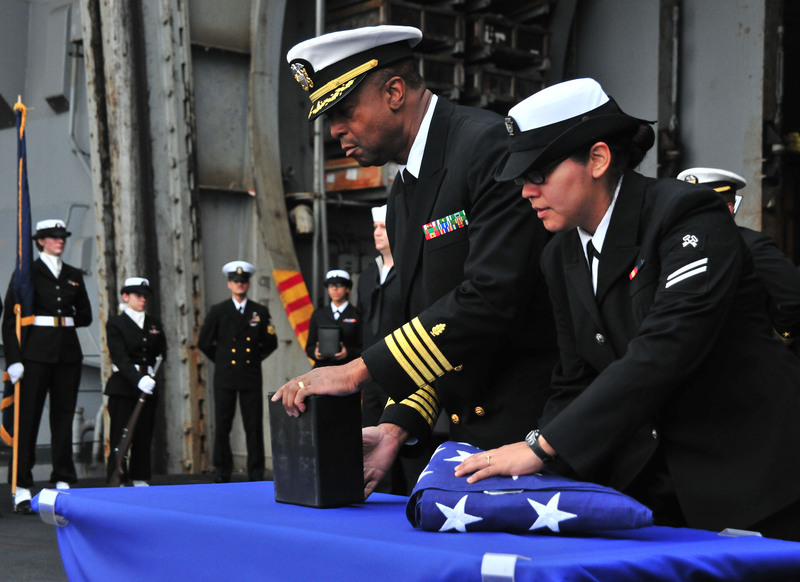 In the Navy’s culture, as the final honor to give to shipmates, traditions are employed that not only signify the service of the deceased, but also display our nation’s commitment to their legacy. Atlantic Ocean, December 6, 2014. Capt. John Carter, commanding officer of the amphibious assault ship USS Bataan (LHD 5) salutes during a burial-at-sea. Bataan is conducting an underway evolution in preparation for an upcoming planned maintenance availability. Pacific Ocean, August 19, 2007. 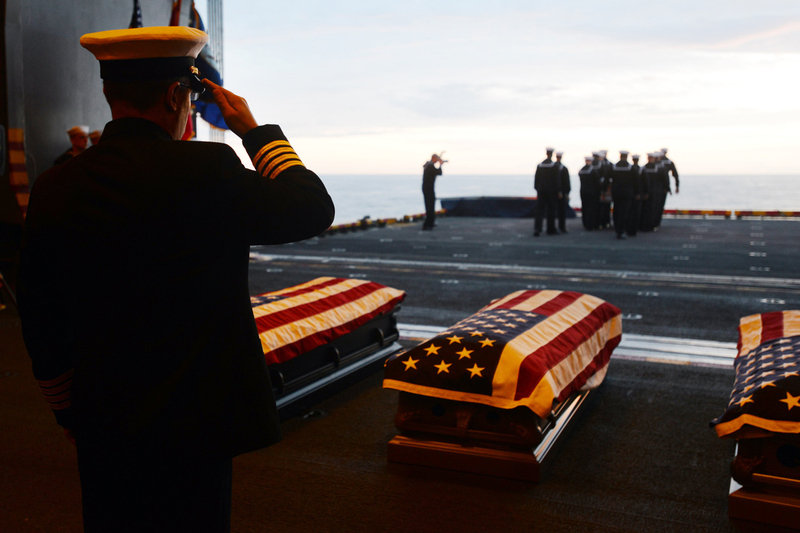 US Navy flag bearers bow their heads in prayer during a burial at sea ceremony aboard Nimitz-class aircraft carrier USS Abraham Lincoln (CVN 72). Lincoln conducted the solemn and sacred tradition of burial at sea for 11 former service members during her transit home to Everett, Washington. Lincoln completed carrier qualifications, Tailored Ship’s Training Availability and Final Evaluation Problem during a scheduled work-up off the coast of Southern California. U.S. Navy photo by Mass Communication Specialist 3rd Class James R. Evans. Arabian Sea, April 9, 2011. Sailors aboard the aircraft carrier USS Enterprise (CVN 65) prepare to cast ashes overboard during a burial at sea. Enterprise and Carrier Air Wing (CVW) 1 are conducting close-air support missions in the U.S. 5th Fleet area of responsibility. U.S. Navy photo by Mass Communication Specialist Seaman Jesse L. Gonzalez. 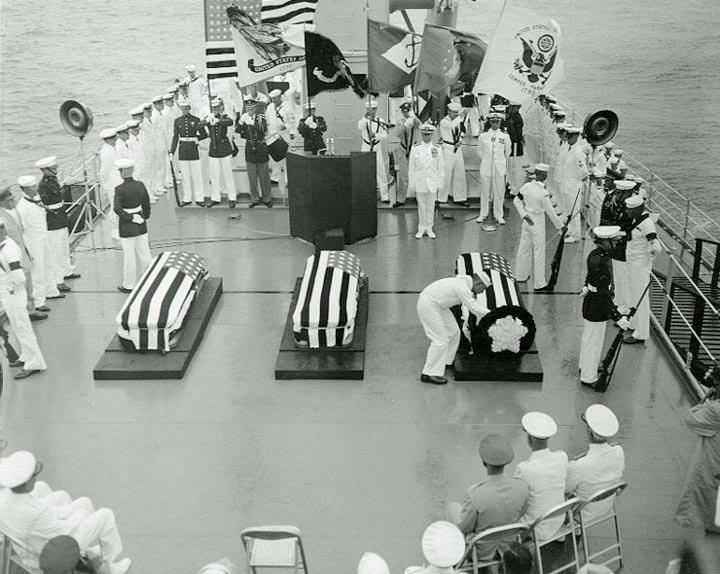 Ceremonies for the selection of the World War II Unknown Serviceman were conducted on board USS Canberra (CAG 2) on May 26, 1958. Medal of Honor recipient Hospitalman William R. Charette, selected the Unknown Serviceman. After the ceremonies, the ‪‎WWII‬ Unknown Serviceman was transported for interment at Arlington National Cemetery on ‪Memorial Day‬, which fell on May 31. 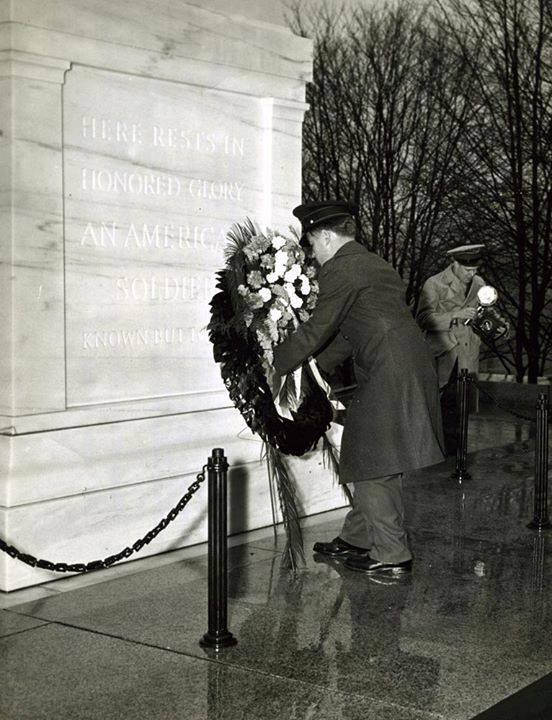 Private First Class Frank Calvin, USMC, places the wreath on the Tomb of the Unknown Soldier. Private Calvin is himself the recipient of two Navy Crosses, the Purple Heart, and the Presidential Unit Citation, circa 1943. 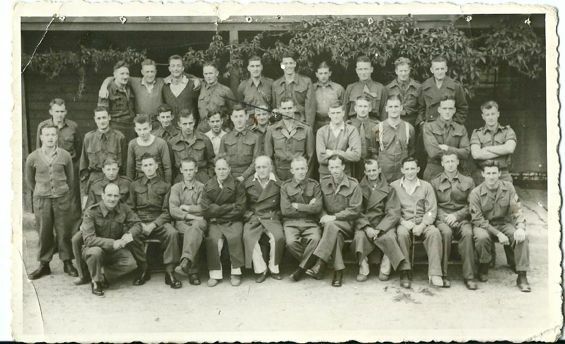 Unknown Servicemen of World War II and the Korean War. Crewmen of USS Boston (CAG 1) render honors as the first casket is transferred to USS Canberra (CAG-2), prior to ceremonies on board Canberra to select the Unknown Serviceman of World War II. Two more caskets are still on board Boston, visible just aft of the starboard whaleboat davits. The ceremonies took place off the Virginia Capes on 26 May 1958. Official U.S. Navy Photograph. Unknown Servicemen of World War II and the Korean War. Hospitalman 1st Class William R. Charette, who received the Medal of Honor for Korean War heroism, selects the Unknown Serviceman of World War II, during ceremonies on board USS Canberra (CAG-2) off the Virginia Capes on 26 May 1958. 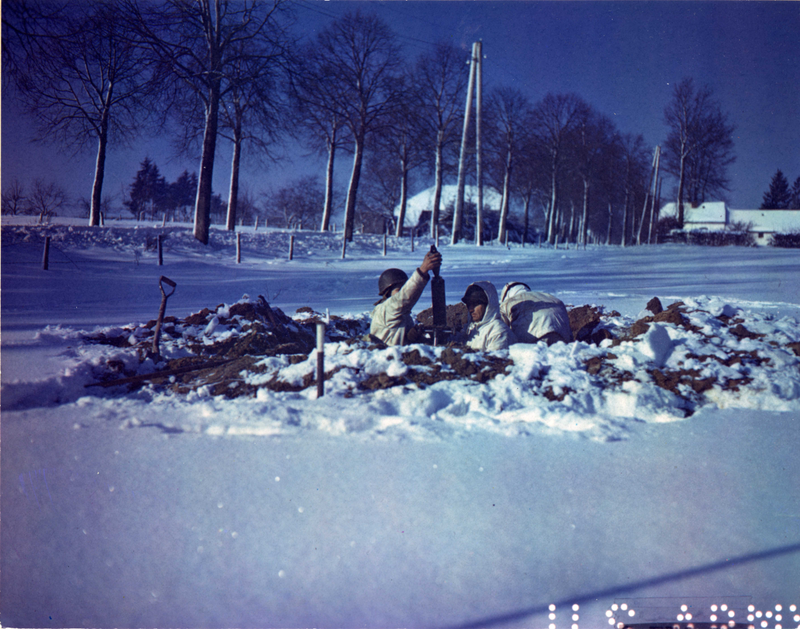 The other World War II Unknown Serviceman candidate’s casket is at left, with the Unknown Serviceman of the Korean War in the middle. 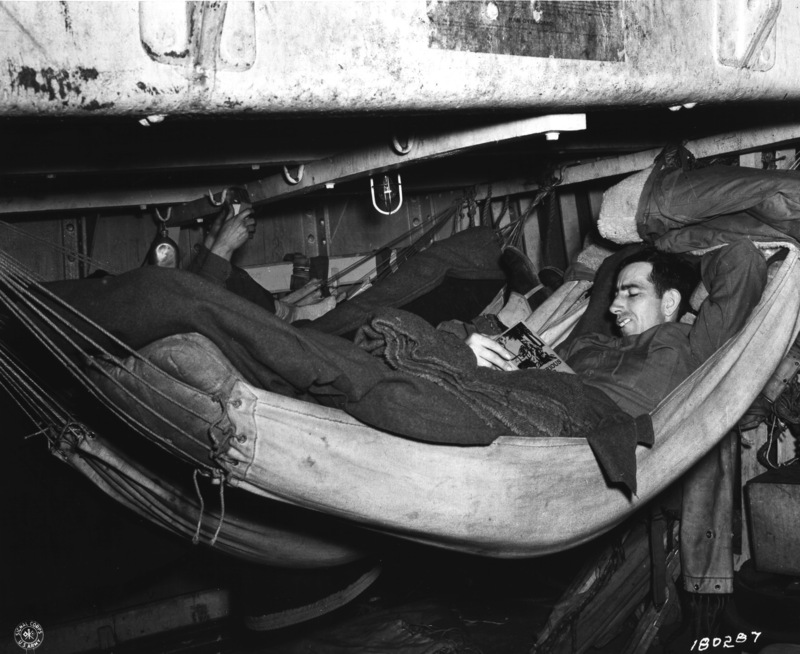 The other Unknown Serviceman from WWII not chose was given a solemn burial at sea. After completion of the selection ceremonies, the World War II and Korean War Unknown Servicemen were carried to Washington, D.C., for burial at Arlington Cemetery. Official U.S. Navy Photograph. Note: At that time, Hospitalman 1st Class William R. Charette was the Navy’s only active-duty Medal of Honor recipient. Above photo: An Army member of the joint services casket team carries the folded U.S. flag from the casket of the Unknown Serviceman of the Vietnam Era to President Ronald Reagan, left, during the interment ceremony at the Tomb of the Unknowns in Arlington National Cemetery. Photographed by Mickey Sanborn, 28 May 1984. The Unknown service member from the Vietnam War was designated by Medal of Honor recipient U.S. Marine Corps Sgt. Maj. Allan Jay Kellogg Jr. during a ceremony at Pearl Harbor, Hawaii, May 17, 1984. 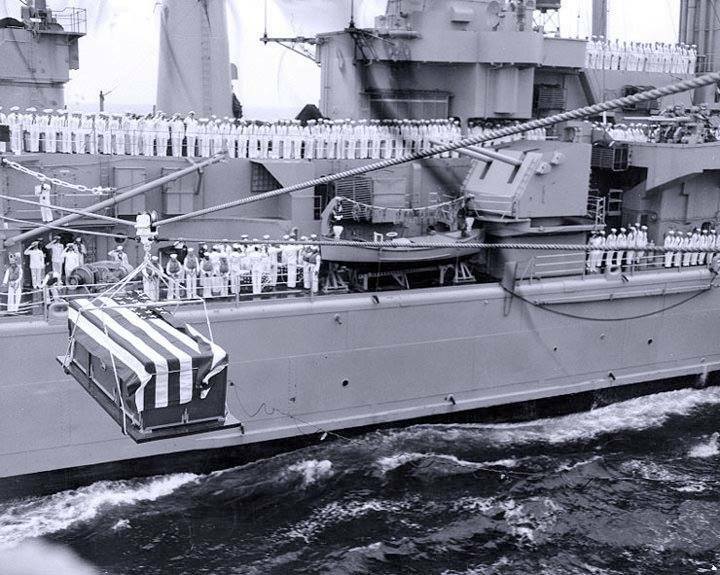 The Vietnam Unknown was transported aboard the USS Brewton to Alameda Naval Base, Calif. The remains were sent to Travis Air Force Base, Calif., May 24. The Vietnam Unknown arrived at Andrews Air Force Base, Md., the next day. Many Vietnam veterans and President and Mrs. Ronald Reagan visited the Vietnam Unknown in the U.S. Capitol. An Army caisson carried the Vietnam Unknown from the Capitol to the Memorial Amphitheater at Arlington National Cemetery on Memorial Day, May 28, 1984. President Reagan presided over the funeral, and presented the Medal of Honor to the Vietnam Unknown. 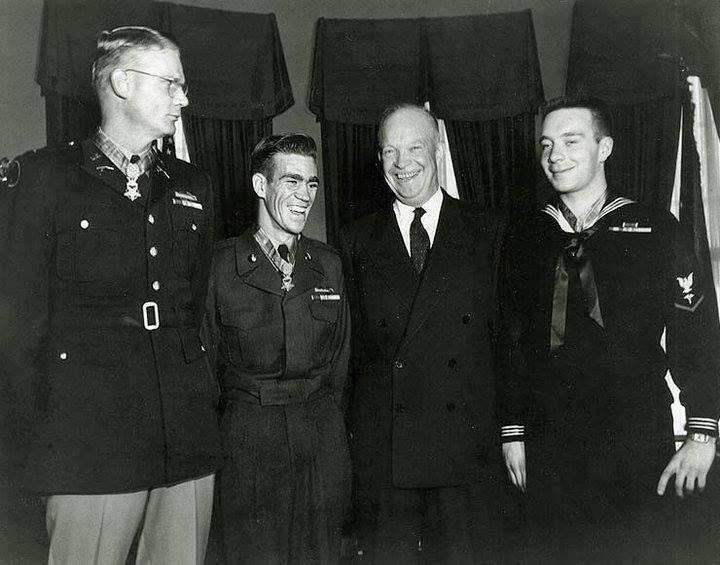 President Dwight D. Eisenhower poses with three men to whom he has just presented the Medal of Honor for conspicuous gallantry in Korean War combat action, at the White House, Washington, D.C., 12 January 1954. Those who received the medal are (from left to right): First Lieutenant Edward R. Schowalter, Jr., U.S. Army, honored for his actions near Kumhwa, Korea, on 14 October 1952; Private First Class Ernest E. West, U.S. Army, honored for his actions near Sataeri, Korea, on 12 October 1952; and Hospital Corpsman Third Class William R. Charette, U.S. Navy, honored for his actions in Korea on 17 March 1953. Official U.S. Navy Photograph. Skylab 2 Astronauts pictured in-front of a Skylab 2 model. 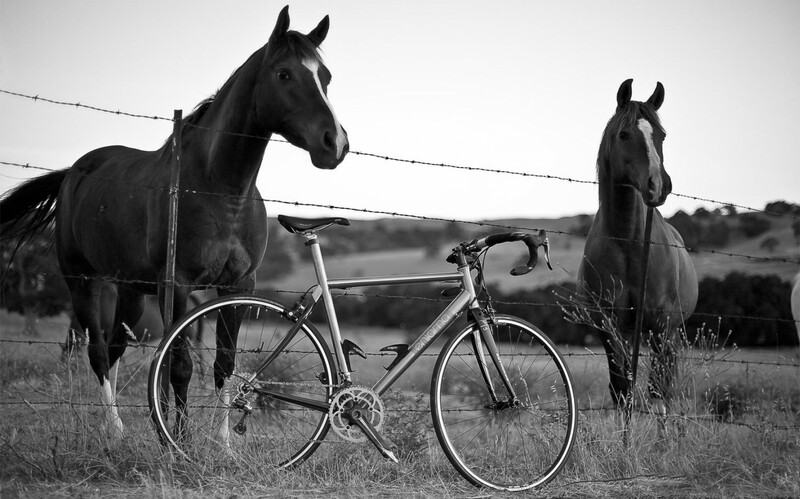 Left to right: Cmdr. Joseph P. Kerwin, USN; Capt. 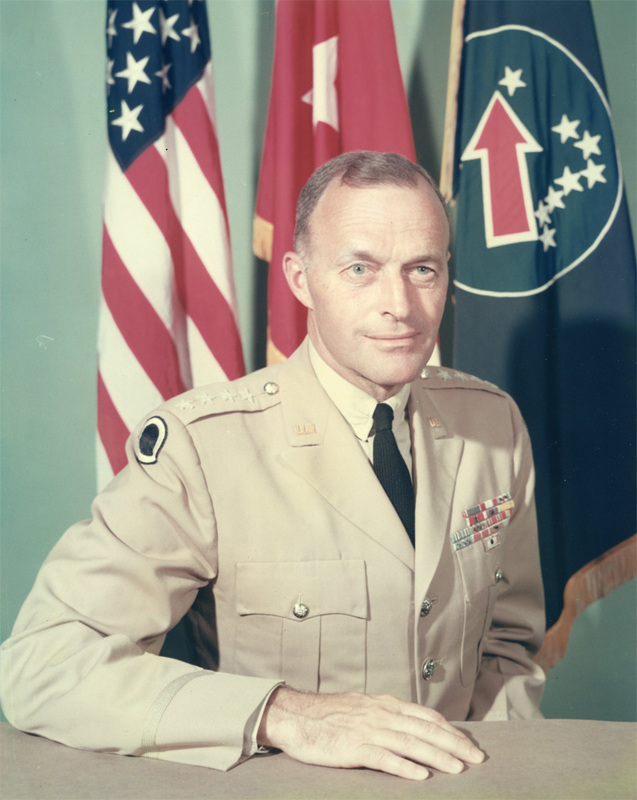 Charles Conrad, Jr., USN; and Cmdr. Paul J. Weitz, USN. 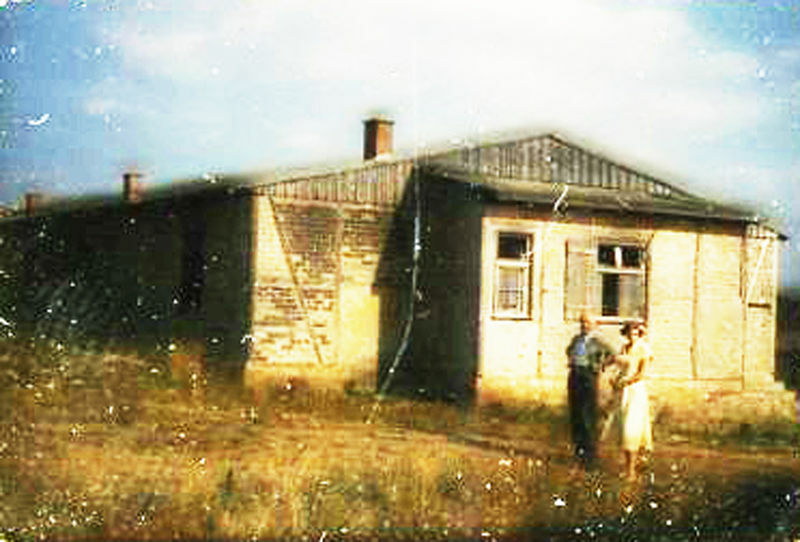 NASA Photograph. USS Ticonderoga (CVS 14). 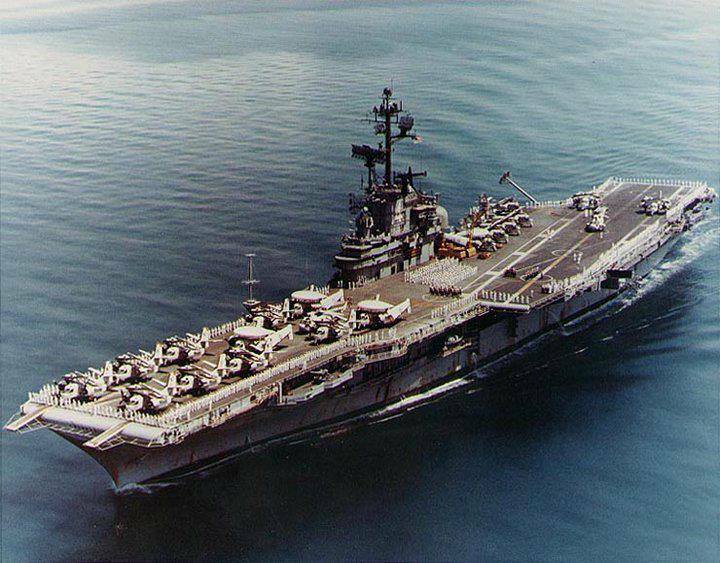 With her rails manned, circa 1970-72, following conversion to an anti-submarine warfare support aircraft carrier. 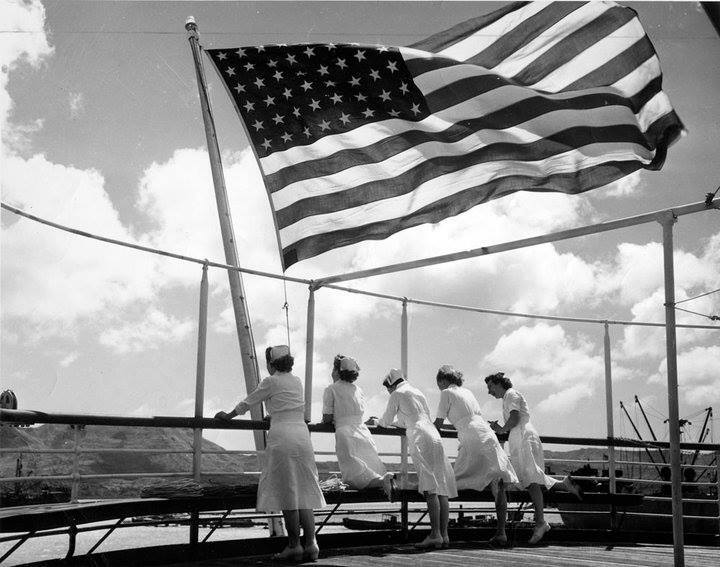 Official U.S. Navy Photograph. 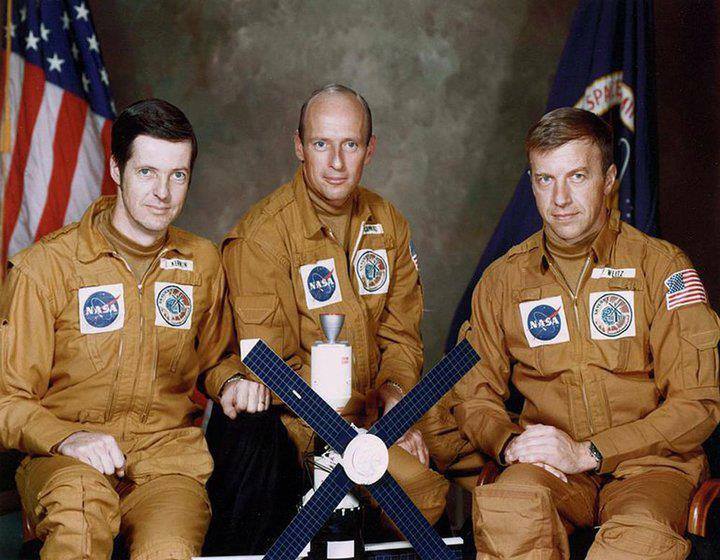 These three men are the crewmen for the first manned Skylab mission. 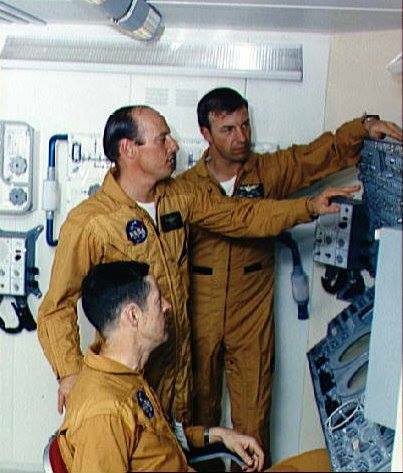 They are Charles Conrad Jr., commander, standing left; scientist-astronaut Joseph P. Kerwin, seated; and Astronaut Paul J. Weitz, pilot. They were photographed and interviewed during an “open house” press day in the realistic atmosphere of the Multiple Docking Adapter (MDA) trainer in the Mission Simulation and Training Facility at the Manned Spacecraft Center (MSC). The control and display panel for the Apollo Telescope Mount (ATM) is at right. NASA Photograph Collection. 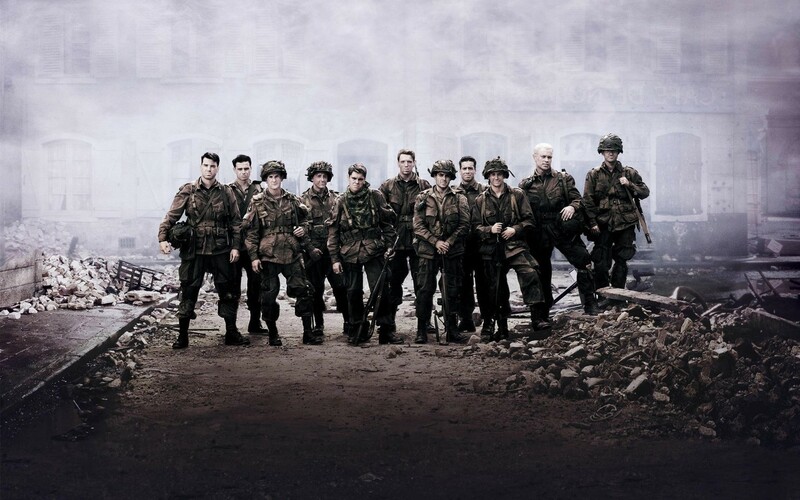 Heroes and Warriors, all of them! 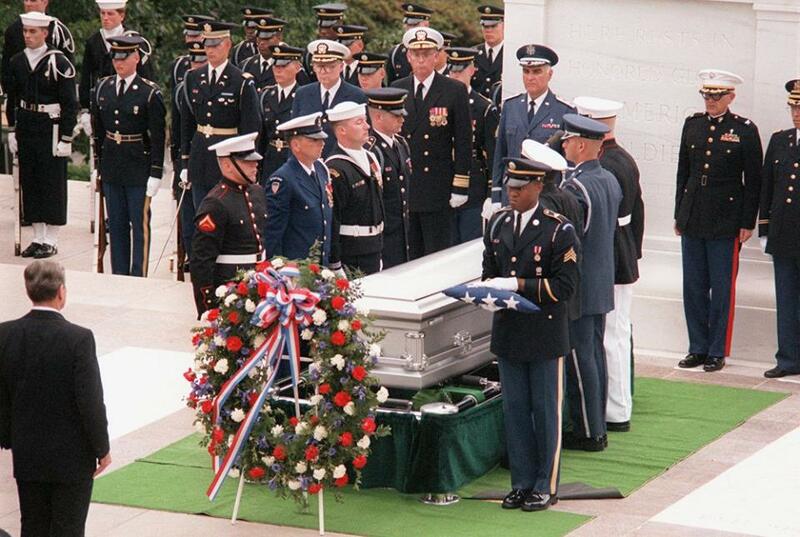 For information on requesting military funeral honors, visit https://www.dmdc.osd.mil/mfh. 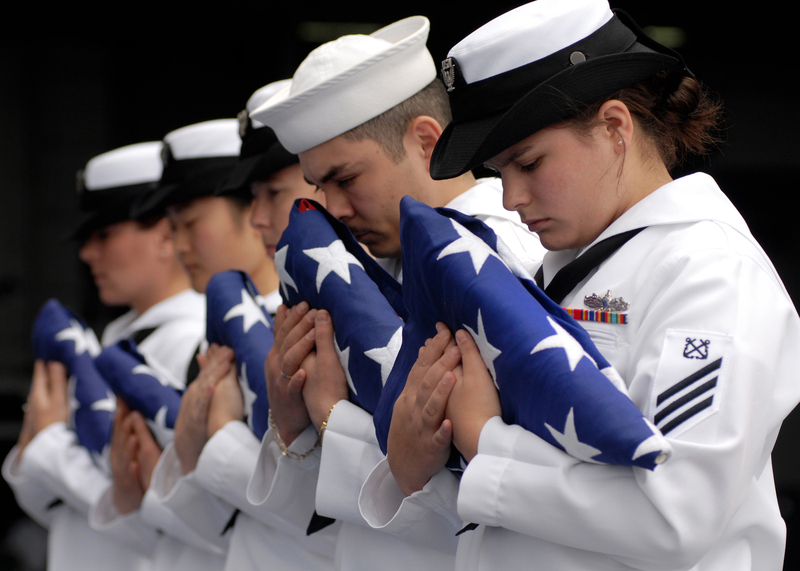 For detailed information and protocol for Navy military funerals, see Bureau of Naval Personnel instruction NAVPERS 15555D. 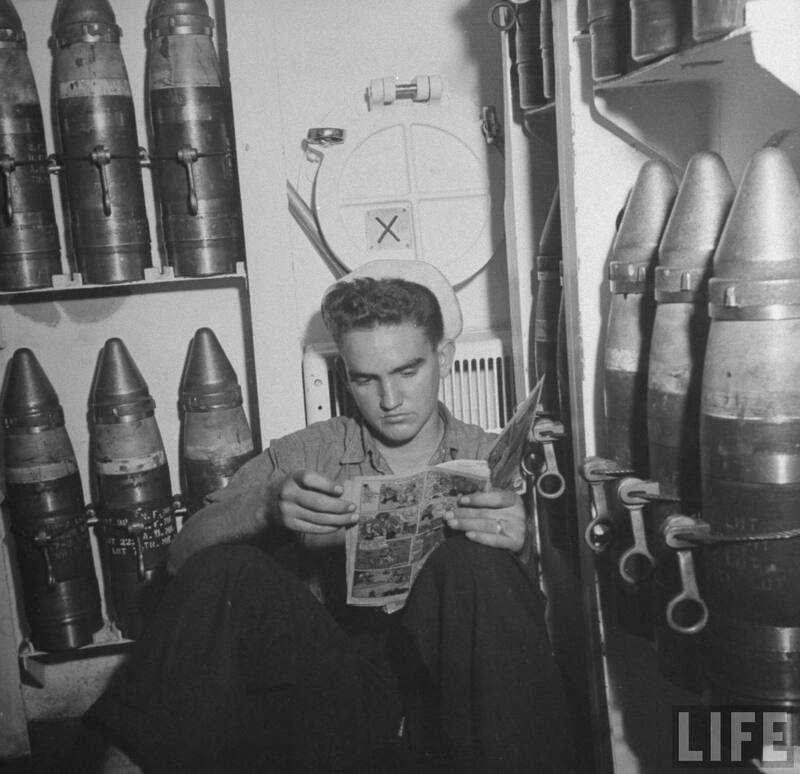 For information on burial at sea, contact the U.S. Navy Mortuary Affairs Burial At Sea Program. French Legion of Honor medals. The medal is the highest French distinction. Six World War II veterans were honored with French Legion of Honor medals. The medal is the highest French distinction. The medals were bestowed upon the veterans by French Consul General Gregor Trumel. A ceremony was held on Thursday at The National WWII Museum in New Orleans. The Legion of Honor Medal was created by Napoleon in 1802 to acknowledge services rendered to France by persons of exceptional merit and accomplishments. 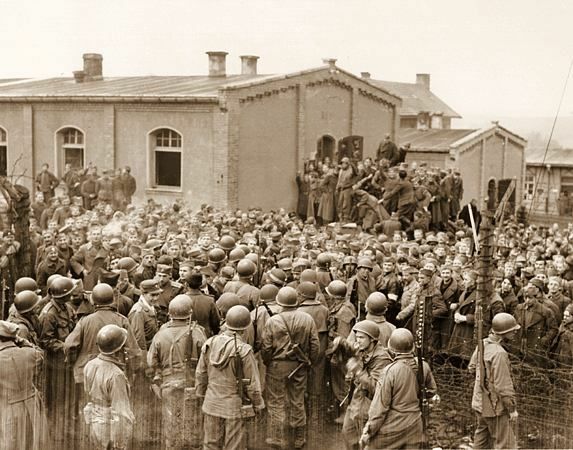 French representatives expressed their gratitude and appreciation for their contribution to the liberation of France during World War II. The six were named Chevaliers de la Légion d’honneur, Knights in the order of the Legion of Honor. WWII Veteran Charles ‘Chick’ Bruns of Champaign IL was selected and appointed to the rank of Knight of the Legion of Honor, France’s highest distinction. 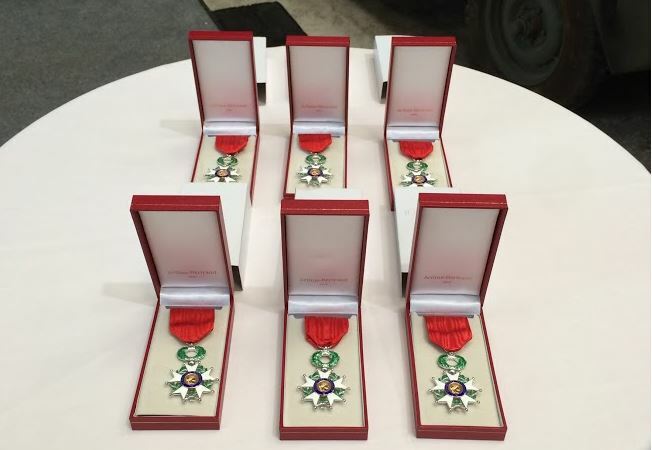 Through this award, the French government pays tribute to the soldiers who did so much for France 70 years ago. Presented by Vincent Floreani, Consul General de France a Chicago, “you gave your youth to France and the French people. Many of your fellow soldiers did not return but they remain in our hearts”. The French National Order of the Legion of Honor is an order of distinction first established by Napoleon Bonaparte in 1802. 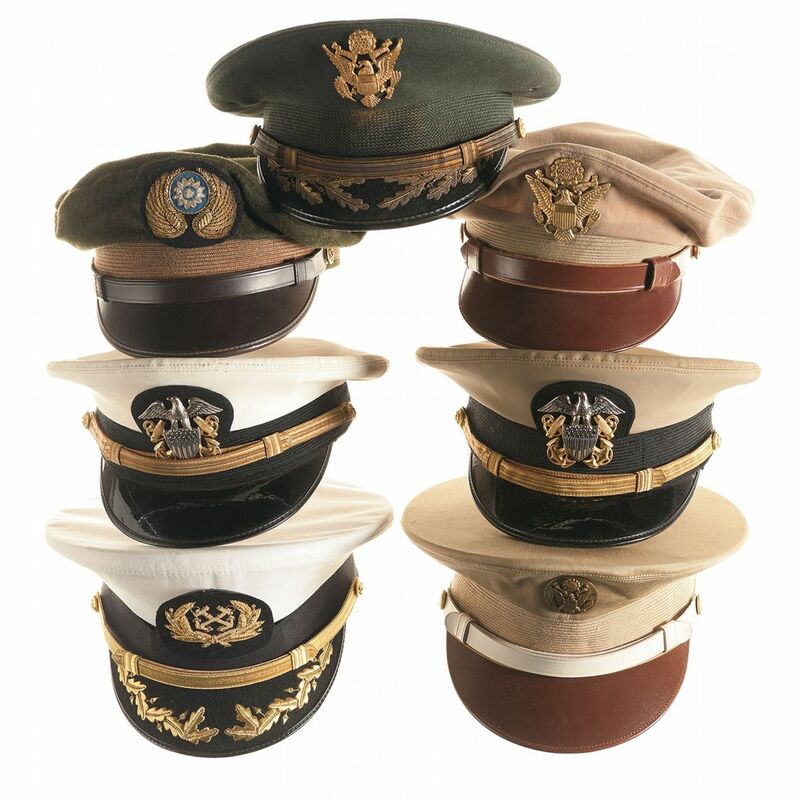 American recipients include Generals Dwight D. Eisenhower and Douglas MacArthur and Admiral Michael Mullen. Today there are approximately 93,000 Legion of Honor recipients. American veterans like Chick who risked their lives during World War II and who fought on French territory qualify to be decorated as Knights of the Legion of Honor. 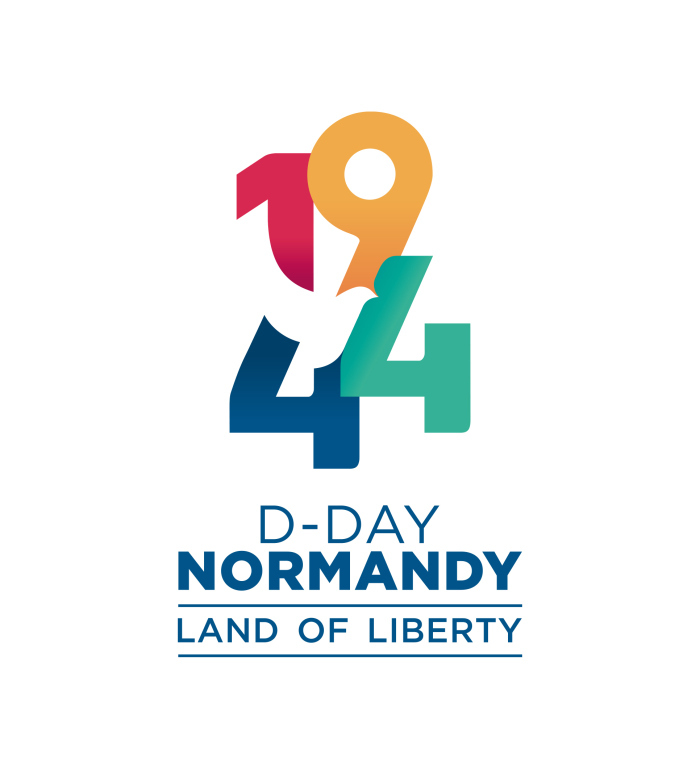 Veterans must have fought in one of the four main campaigns of the Liberation of France: Normandy, Provence, Ardennes, or Northern France. 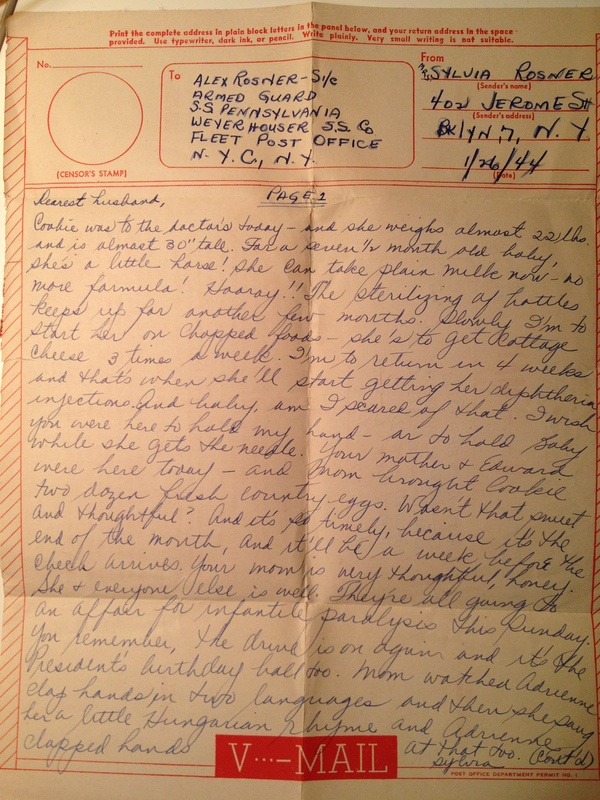 Veteran Charles F. wrote a diary during the second world war which is now being published by his son. 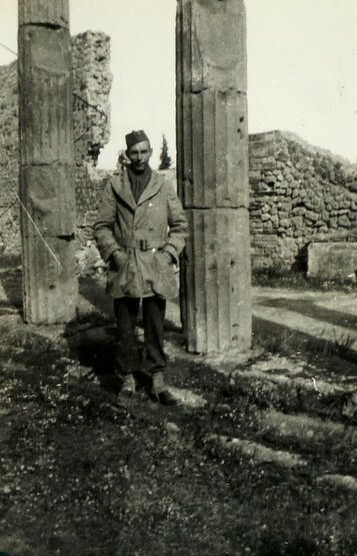 He served in North Africa and Europe until the war ended. 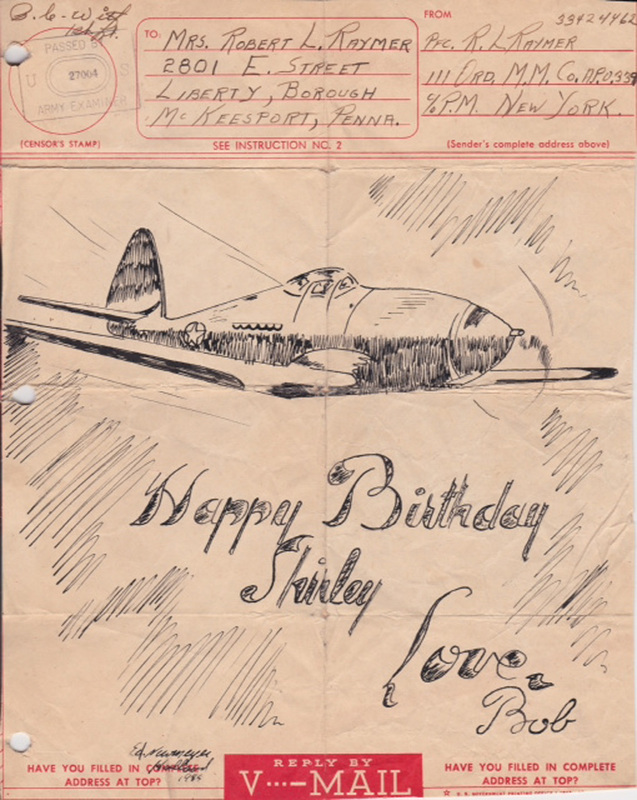 John Bruns, his son, has re-purposed the diary into a website called http://www.70yearsago.com . The website is updated daily. He argues that it is his father who is blogging from the past. Chick Bruns, 94 used to sell clothes at Joseph Kuhn & Co in downtown Champaign before he volunteered to join U.S. Army. 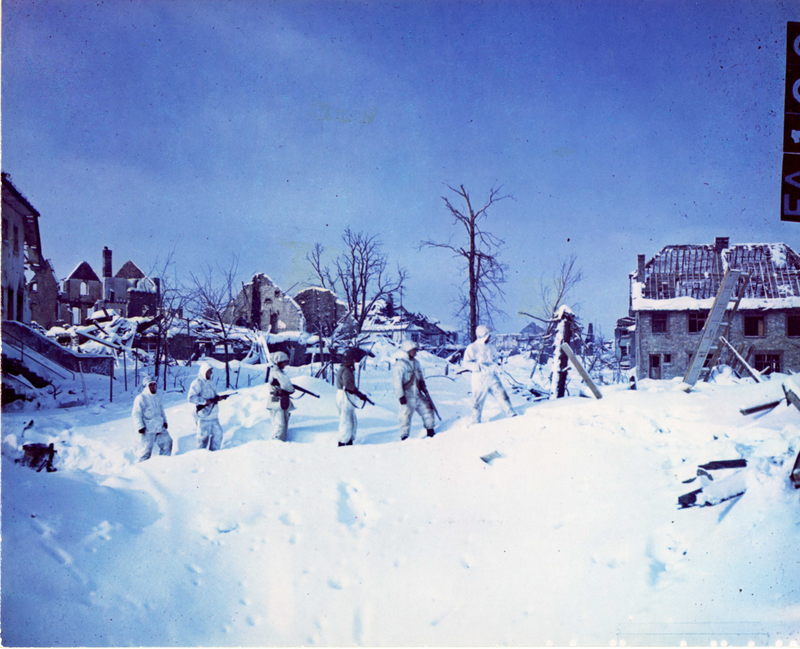 St. Vith, Belgium was the scene of bitter fighting during the opening days of the Battle of the Bulge. 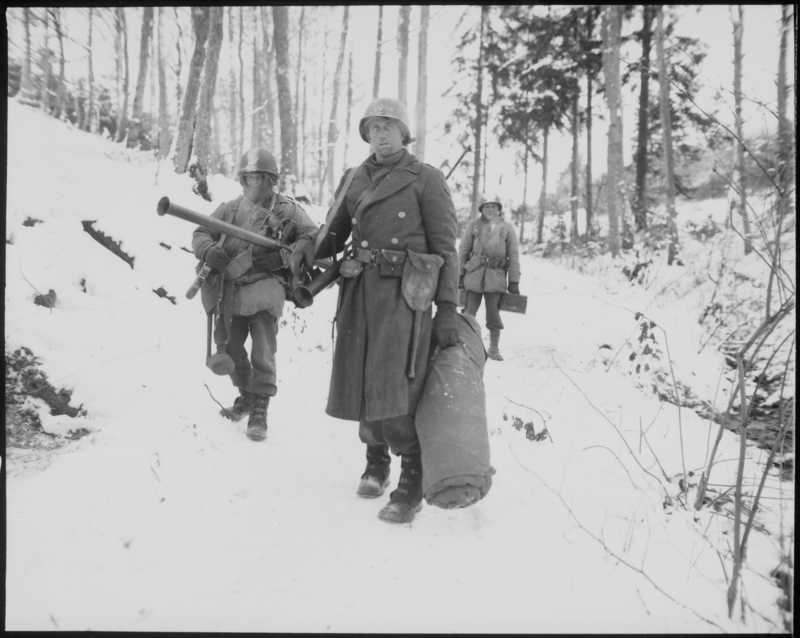 Although the German assault was delayed by fierce resistance, American defenders were eventually forced to withdraw from the town on December 21, 1944. 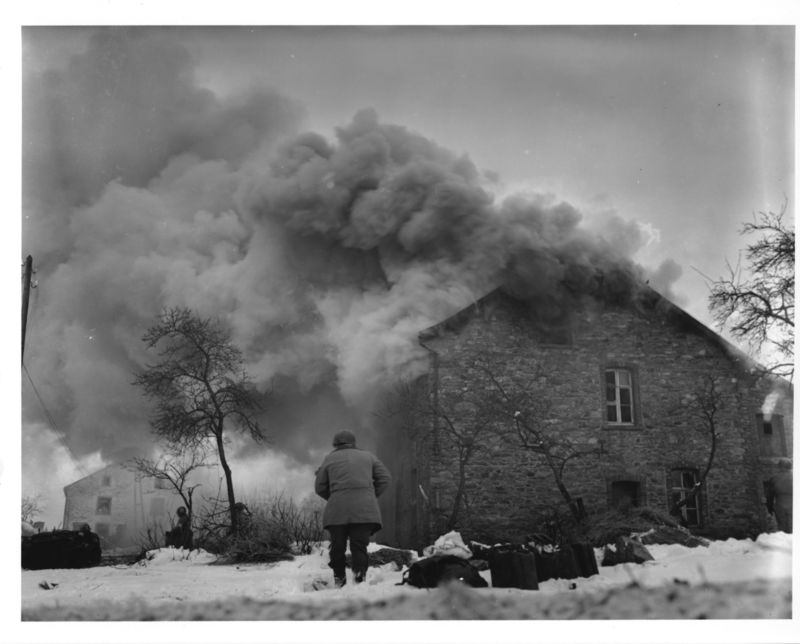 A month later, as the Allied counter-attack rolled back German gains, St. Vith was re-liberated on January 23, 1945. 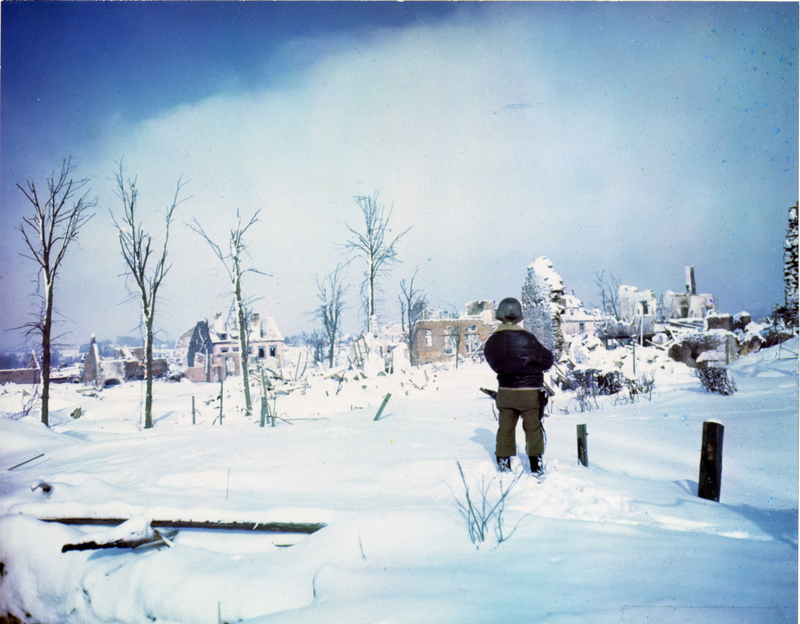 Recently digitized by the National Archives Still Pictures Branch, these color photographs from the U.S. Army Signal Corps show St. Vith and its surroundings in the days following its liberation. This dug-in mortar emplacement near St. Vith, Belgium is manned by, left to right, Pvt. R.W. 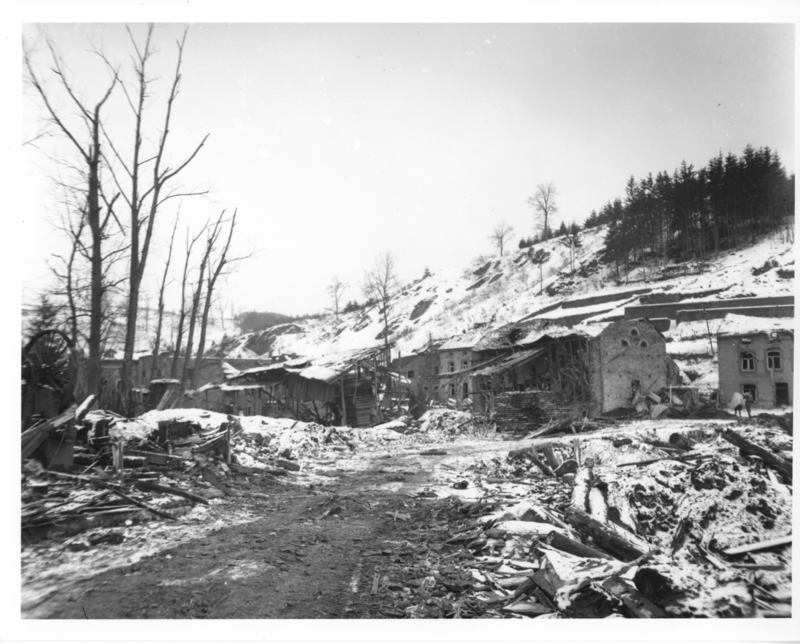 Fierde, Wyahoga Falls, Ohio; S/Sgt. Adam J. Celinca, Windsor, Conn., and T/Sgt. W.O. Thomas, Chicago. 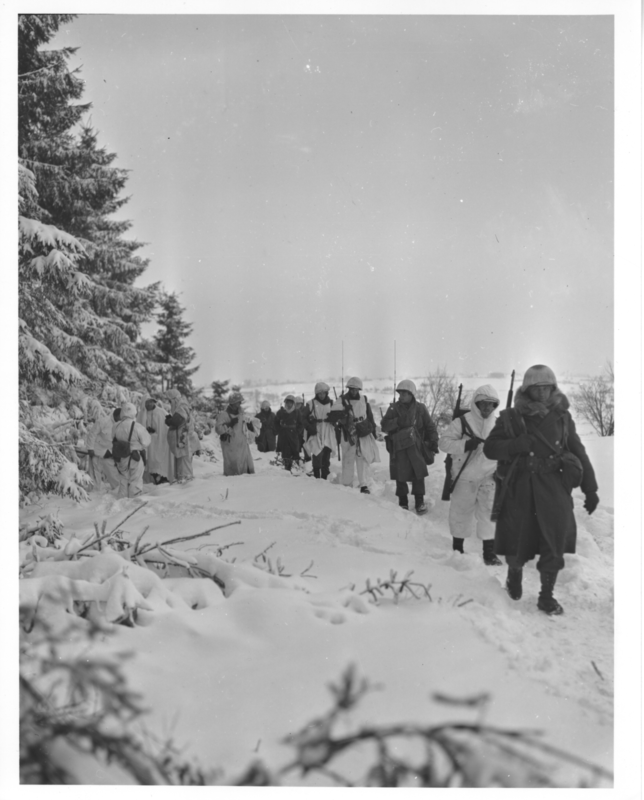 24 Jan. 1945. 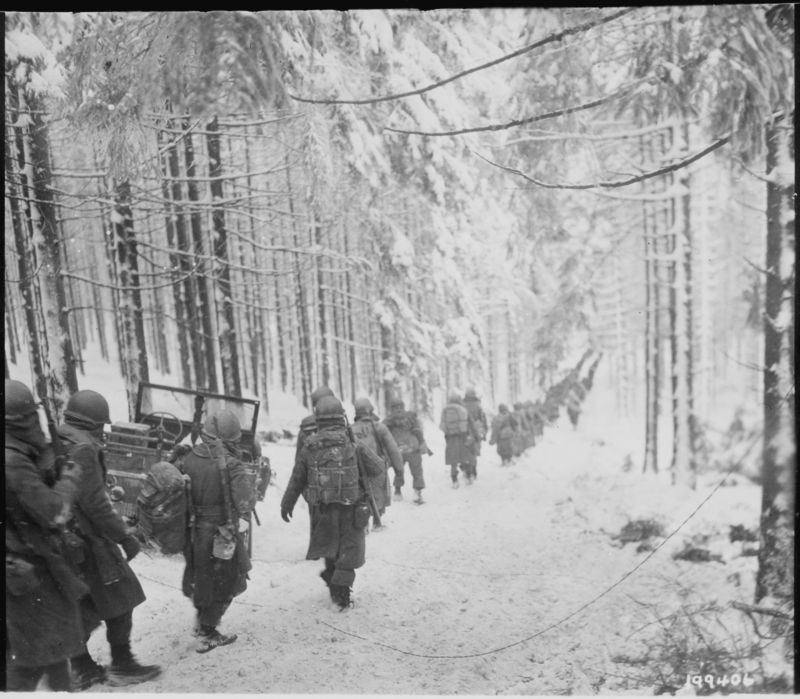 American soldiers trudge through snow from Hunnange, Belgium to St. Vith. 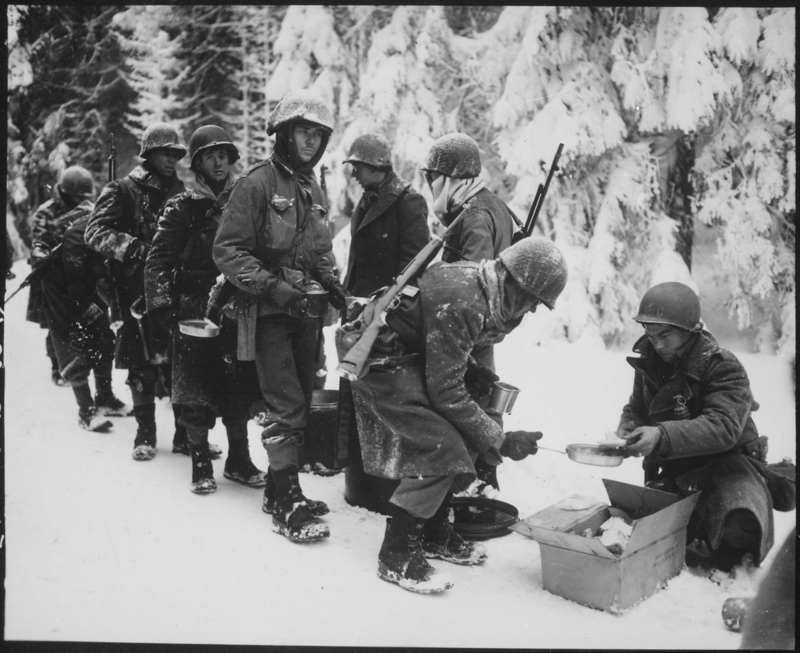 Soldiers are with Co. C., 23rd Armored Bn., of the 7th Armored Division. 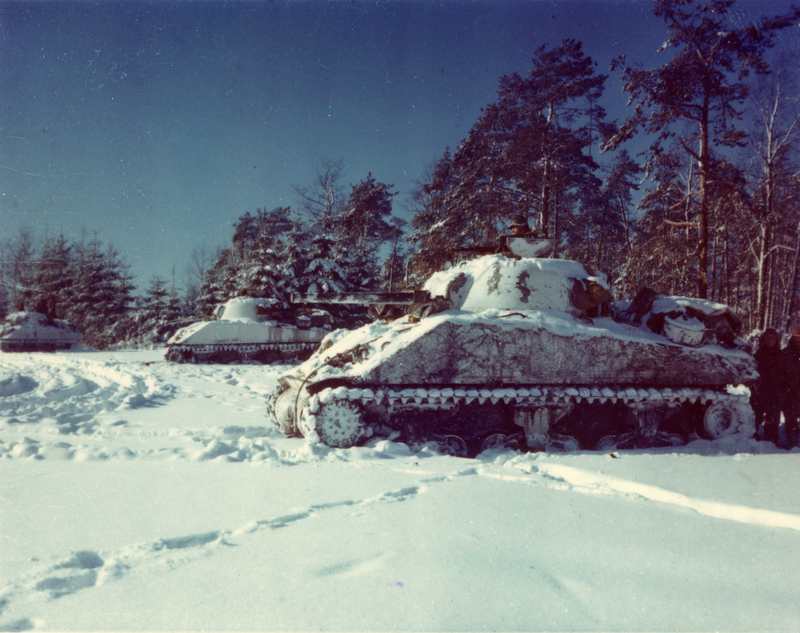 Lined up in a snow-covered field, near St. Vith, Belgium are these M-4 Sherman tanks of the 40th Tank Bn. 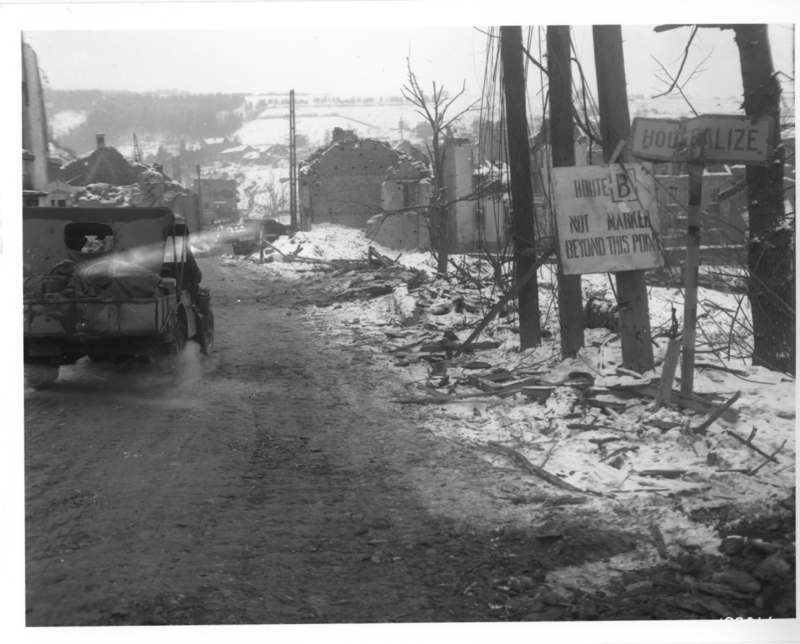 A portion of the wreckage in St. Vith, Belgium, after units of the 7th Armored Division, took the town. Contrary to popular belief, other countries, aside from Germany, were capable of producing tank aces. This story is about a tank commander who destroyed 258 enemy vehicles, but he never was awarded the Knights Cross. He was never presented to Hitler, he never wore a fancy black uniform with death heads and S.S. runes, and he never commanded a Panther or a Tiger. The reason? 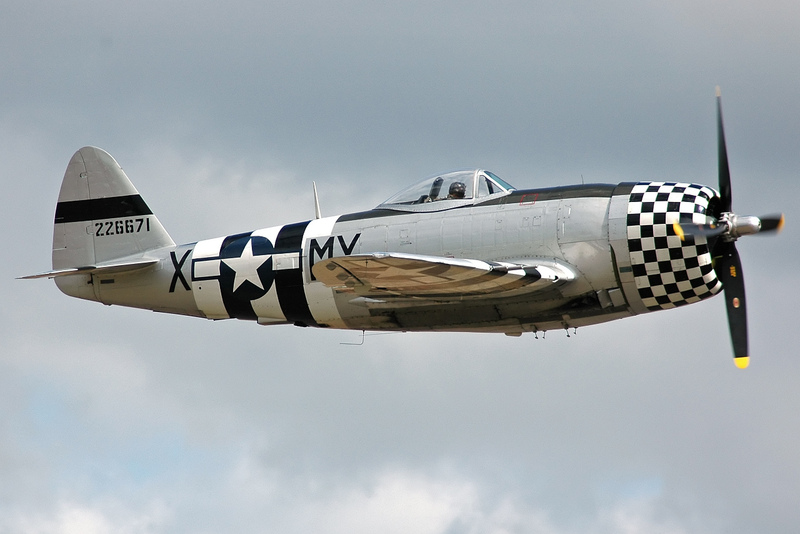 He was an American G.I., and he set the above record in a Sherman tank! Staff Sergeant Lafayette G. Pool was typical of some of the fine tankers produced by the U.S. Army during World War II. Pool was born on July 23,1919, on a farm in Odem, Texas. He graduated from high school in Taft, Texas in 1938. 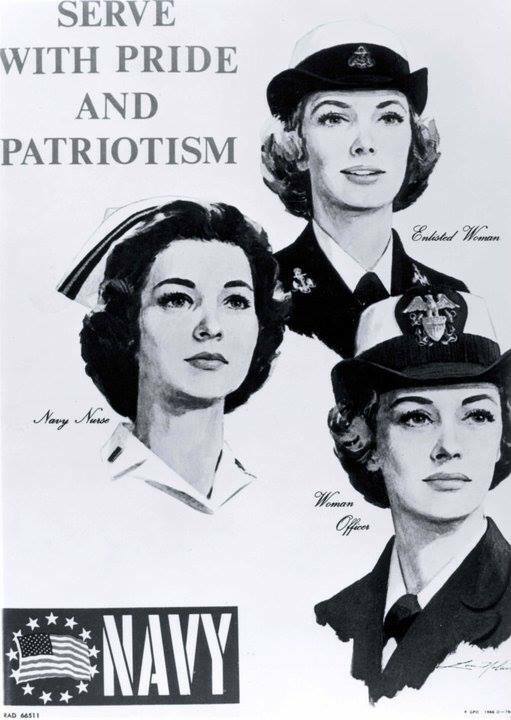 Pool tried to enlist in the Navy. He was turned down due to an eye injury, although his twin brother was accepted. He then enrolled in an all boys Catholic Academy where he graduated as class valedictorian. Afterwards, he enrolled in Texas, A and I College, as an engineering major. He quit to enlist in the Army on June 13, 1941. He took basic training at San Antonio, Texas, and then was sent to Camp Beauregard, Louisiana, to the newly forming Third Armored Division. 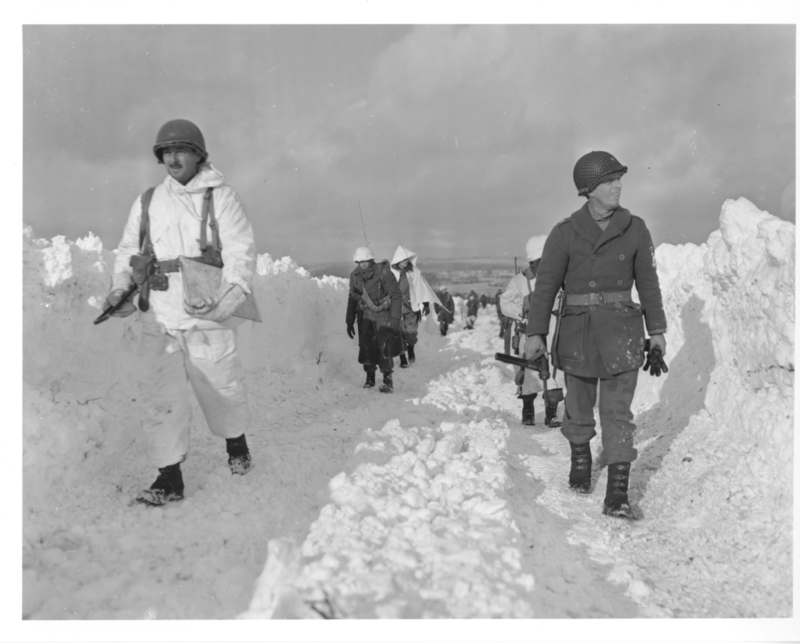 Pool joined the Third Battalion, 32nd Armored Regt, when the division was reorganized in January of 1942. He took time out from training to get married to Evelyn Wright in December of 1942. M4 Sherman tank in the European theatre during WWII. Pool had been a boxer in college and he joined the divisions golden gloves team. He became regional champ in his weight class and was to go to the national meet in Chicago, Illinois in the spring of 1942. He turned down the opportunity because the division had gotten a shipment of new M-4 Sherman Tanks and Pool wanted to start training with his men on the M-4 immediately. Pool was a tall, lanky 6’3″ Texan, who drove his men and himself and trained them rigorously. He always wanted things done right and would not tolerate slipshod methods, whether in maintenance, gunnery, or driving. He demanded the best out of his men and got it. 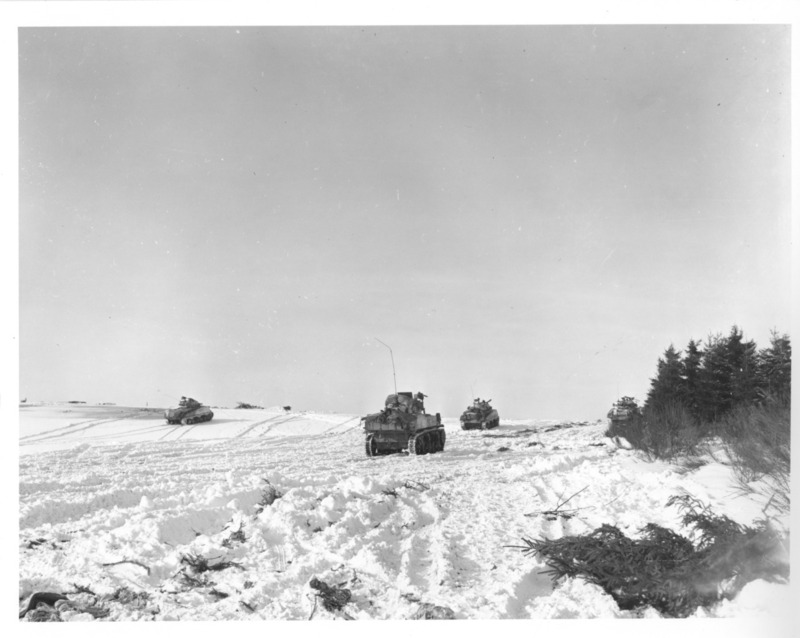 The 3rd Bn, 32nd Armor moved to the Desert Training Center near Victorville, California, followed by final training at Indiantown Gap, Pennsylvania. The only known side angle of Pool’s IN THE MOOD Sherman M4A1(76)W. A number of private collectors and 3AD WWII veterans have prints of varying quality made from the same, original, apparently long-lost negative, but the above image is the most-detailed and sharpest known. The photographer, probably a G.I. amateur, is unknown. The original negative suffered from some blurriness at the bottom left that is probably a camera lens problem. The Sherman, painted camouflage (barely apparent in black & white), appears to be in motion, and Pool is assumed to be in the commander’s hatch. 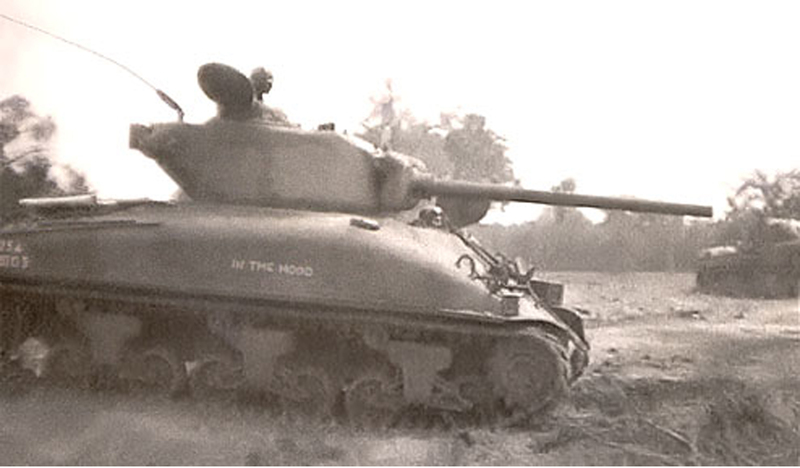 After looking through some of what is published about S/Sgt Lafayette Pool’s tanks named IN THE MOOD, the case can be made that the M4A1 76mm Sherman pictured above is in fact the third tank commanded by Pool to be named IN THE MOOD. 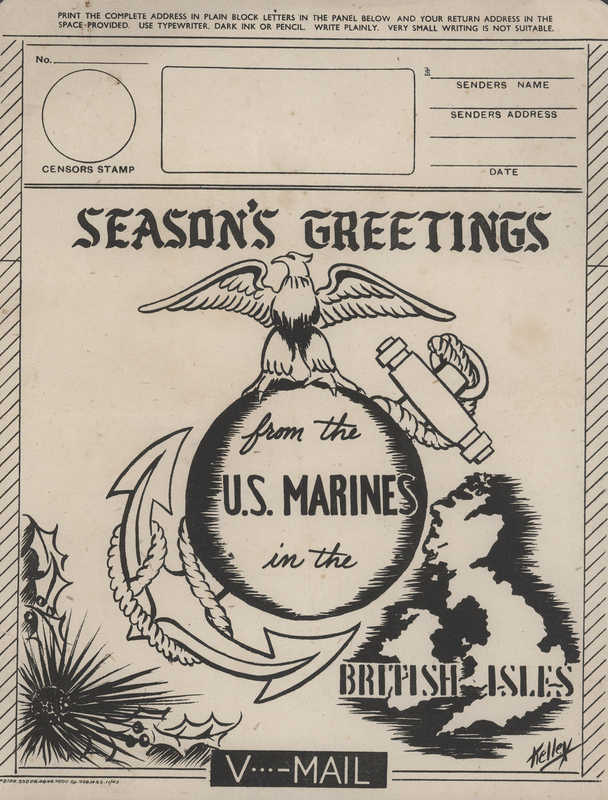 From the 22 September 1944 edition of YANK magazine, in an interview with Pool’s driver Cpl. 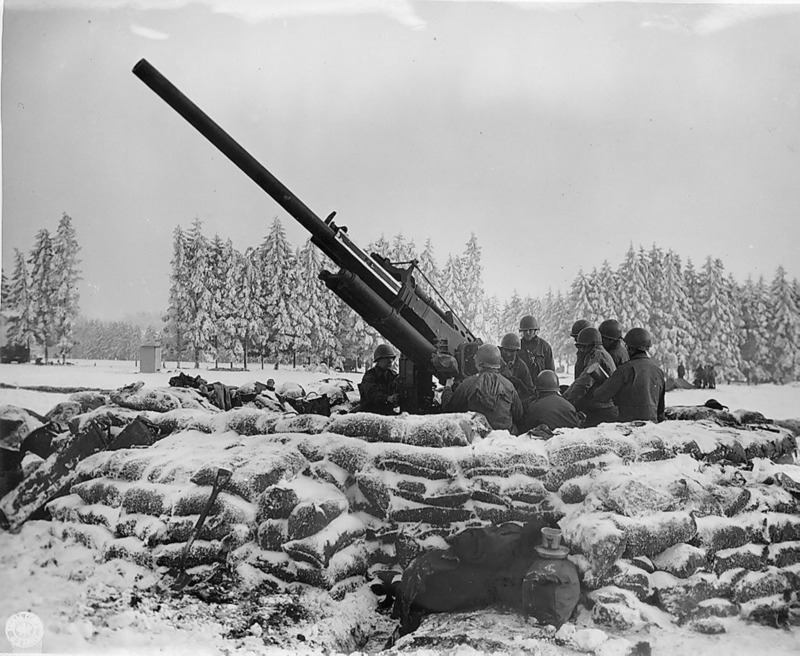 Wilbert Richards and bow gunner Pfc. Bert Close, we are given the locations that the tanks were lost. The first M4 Sherman named IN THE MOOD was lost near the town of La Forge Bois de Bretel, France. The second in the town of Fromentel, France. 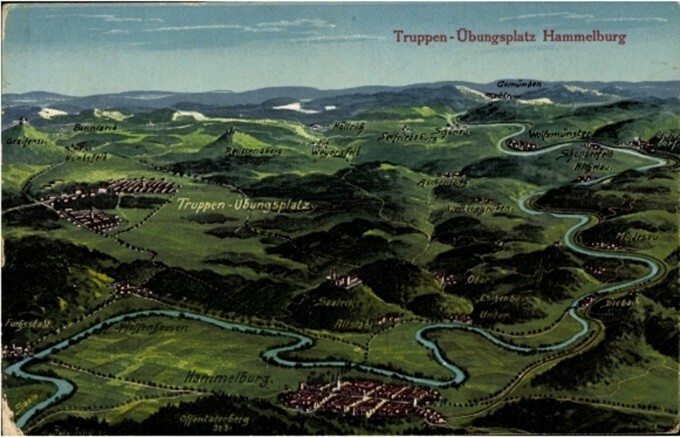 The third was lost near Munsterbusch, Germany. His crew consisted of driver, Wilbert “Baby” Richards, one of the best drivers in the ETO according to Pool; Bert “Schoolboy” Close who was just seventeen years old and was his the bow gunner. Given the choice of prison on a manslaughter rap or the Army, Del “jailbird” Boggs elected to be Pool’s loader. Willis “Groundhog” Oiler was the gunner. Pool said of Oiler, “He could shoot the eyebrows off a gnat at 1500 yards.” He was very quick and alert. One time near Origny in France, it was getting dark when the order came down to halt and coil up for the night. Pool opened his mouth to say “Driver Halt,” but found himself looking down the barrel of a German 88mm in the gloom ahead. He said “Gunner, Fire!” and Oiler, without hesitation, holed the enemy gun before its crew could recognize the Sherman Tank. While in England, Pool did some more boxing. In Liverpool in early 1944 he boxed against Joe Louis. It was meant to be an exhibition bout, but Pool got a little to enthusiastic and rapped Louis a few good ones. Louis put his arm around Pool and said, “White man, I’m going to teach you a big lesson. “He then proceeded to give Pool a good going over, although there was no knockout. Pool was what we would call today a “hard charger.” He was also inclined to have things his own way. 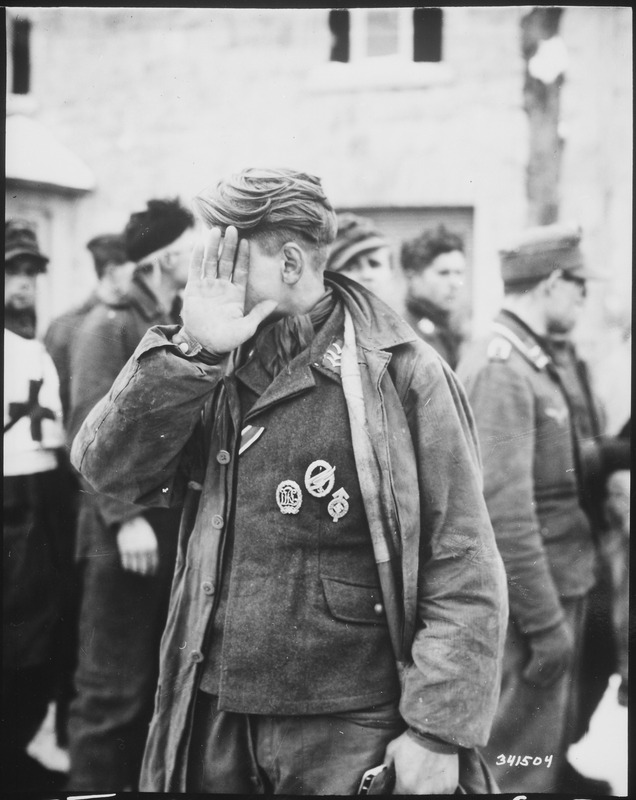 He believed that the quickest way home was to smash the German Army to pieces, and he believed that he was the guy with the crew and the tank that could do it. He made friends easily and also made enemies. He had a quick temper and was not above ignoring orders when they didn’t suit him. Pool landed at Normandy in June, 1944. 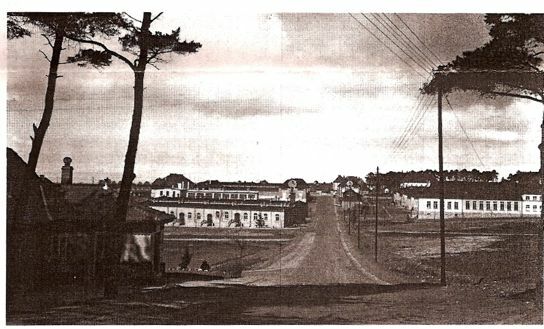 His battalion fought its first engagement on June 29, 1944 near Villier-Fossard, northeast of St. Lo. The loss of Pool’s first tank “In the Mood,” (all succeeding tanks were named “In the Mood!”) was to a Panzerfaust at the village of Les Forges not far from the beachhead. Pool’s crew survived and got a new Sherman, and pushed on undauntedly against the panzers. 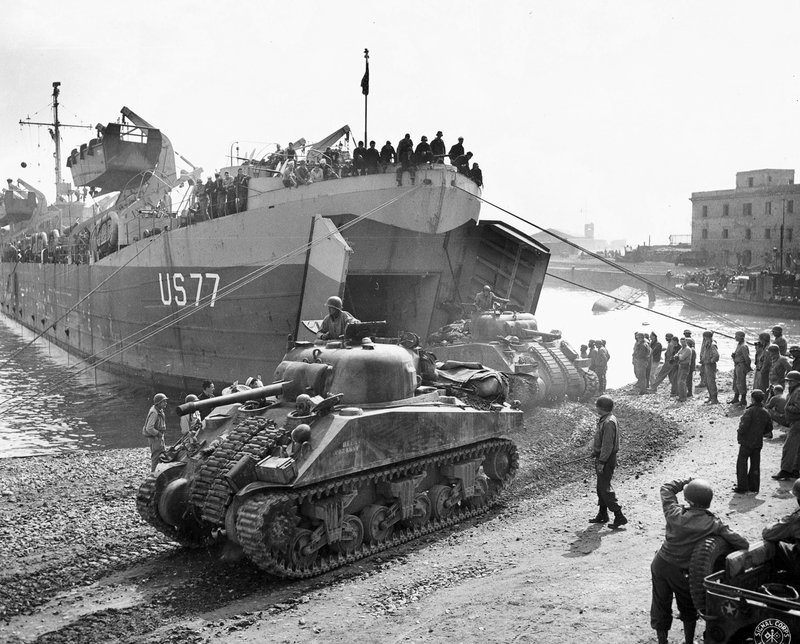 c. 1944/45: Tanks of an Armored regiment are debarking from an LST [US 77] in Anzio harbor [Italy] and added strength to the U.S. Fifth Army [VI Corps] forces on the beachead (WWII Signal Corps Photograph Collection). 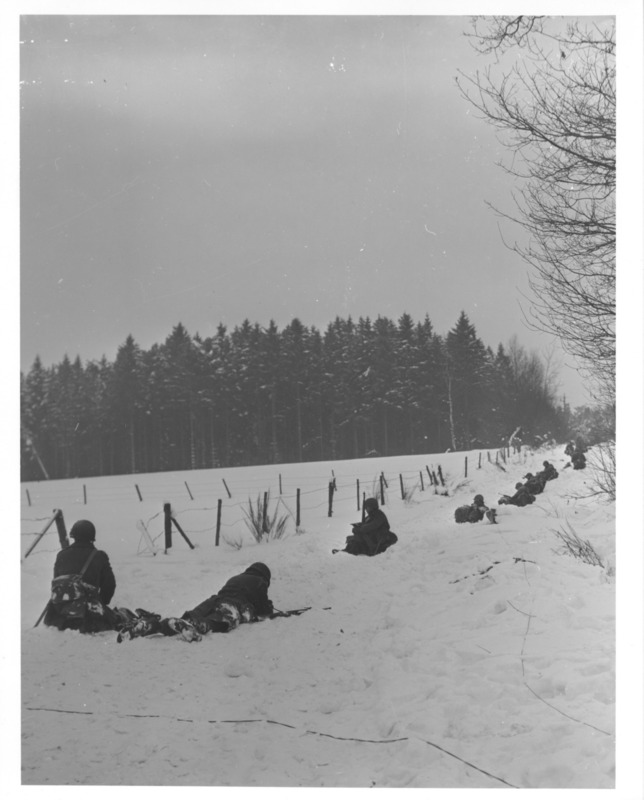 At Fromentel, Pool’s tank headed the task force Y column as usual which closed the gap. 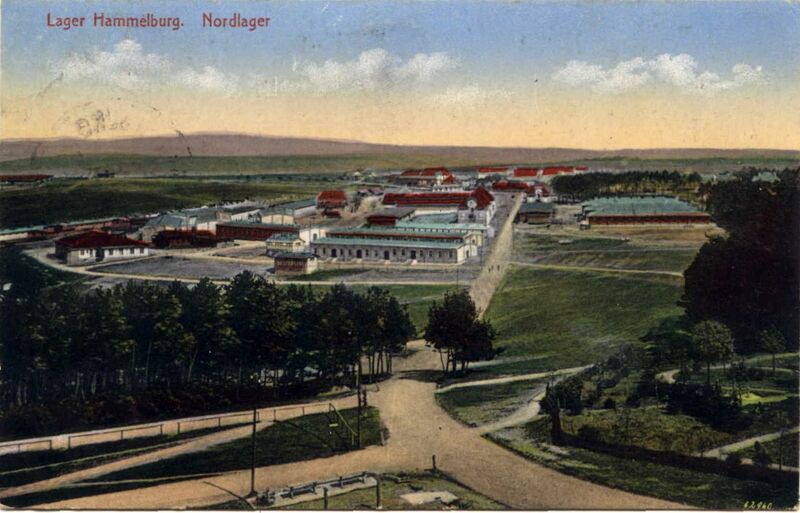 During the closing, Pool’s second tank was destroyed by enemy bombers, which only made Pool more mad at the Germans. Again the crew survived intact. 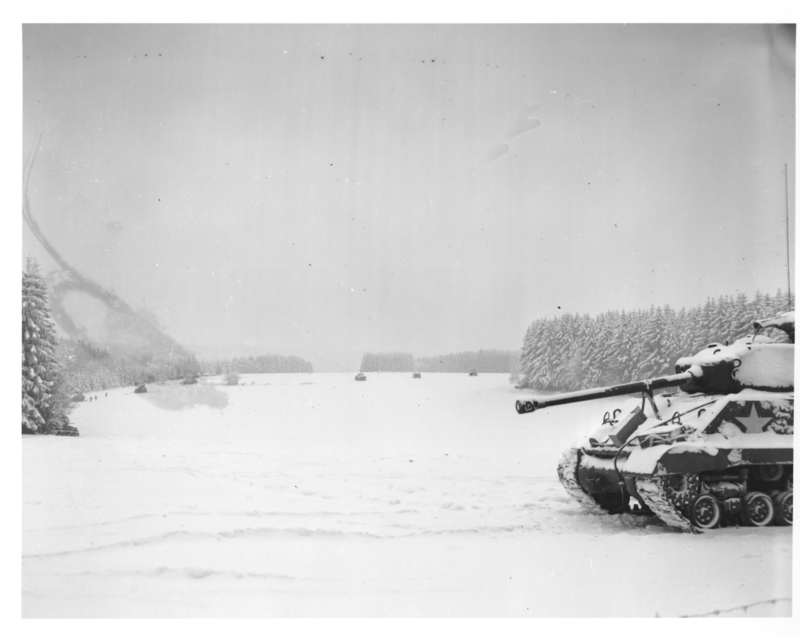 At Colombrier, France, Pool’s tank leading the column almost collided with a Panther. The Panther fired twice and missed. Oiler, the gunner, fired a single shot which penetrated the turret and internal explosions blew the turret clean off the hull of the Panther. 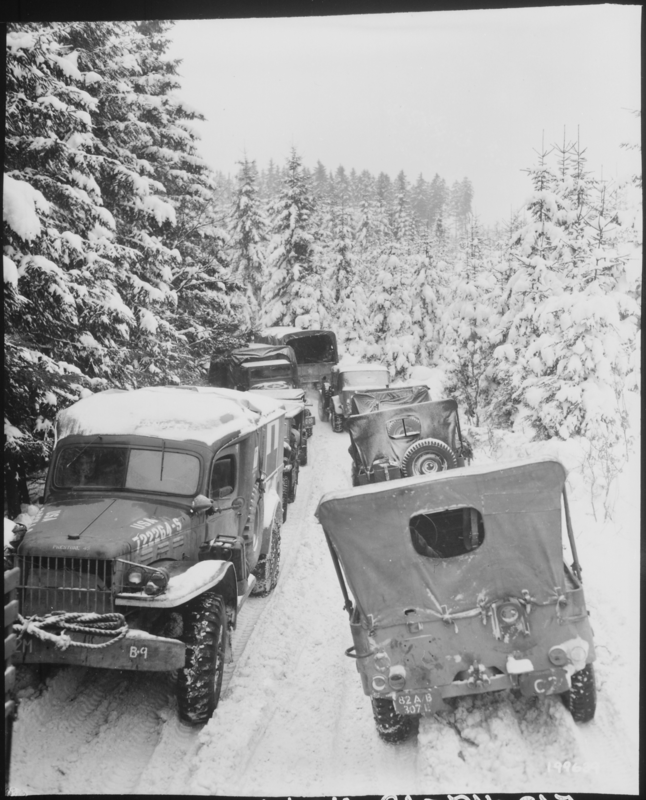 At Namur, Belgium, “In the Mood’s” crew destroyed sixteen enemy vehicles, including assault guns, self-propelled anti-tank guns, plus several armored personnel carriers in one day. At Dison, Belgium, Pool distinguished himself while acting as a platoon leader. He decided to use his own tank to clean out an annoying pocket of resistance on the left flank of the route they were traveling. After finding and destroying six armored personnel carriers Pool discovered that the head of his column had been fired upon by a German Panther. Quickly he ordered his driver to regain the column. 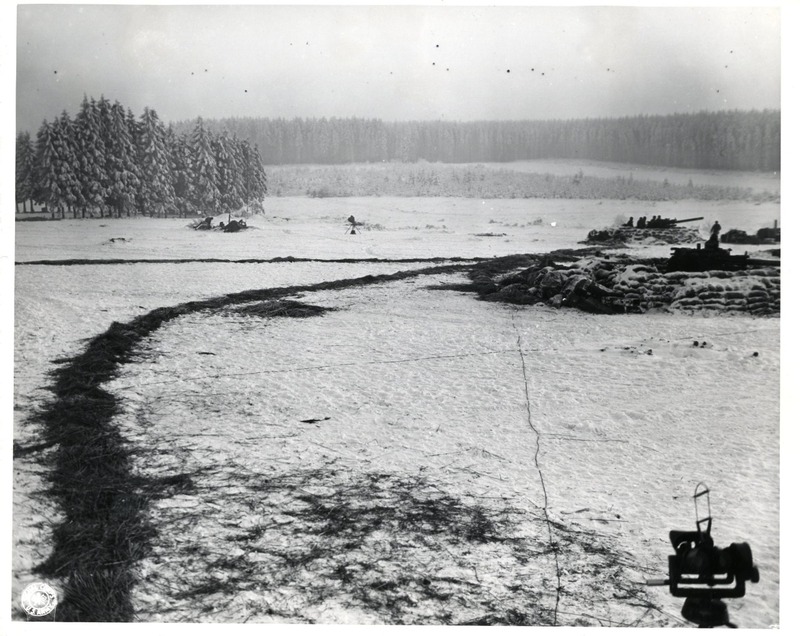 Upon arriving upon the scene of the action he spotted the enemy tank, gave a single estimated range to Oiler. The gunner fired an A.P. projectile at 1,500 yards to destroy the Panther. 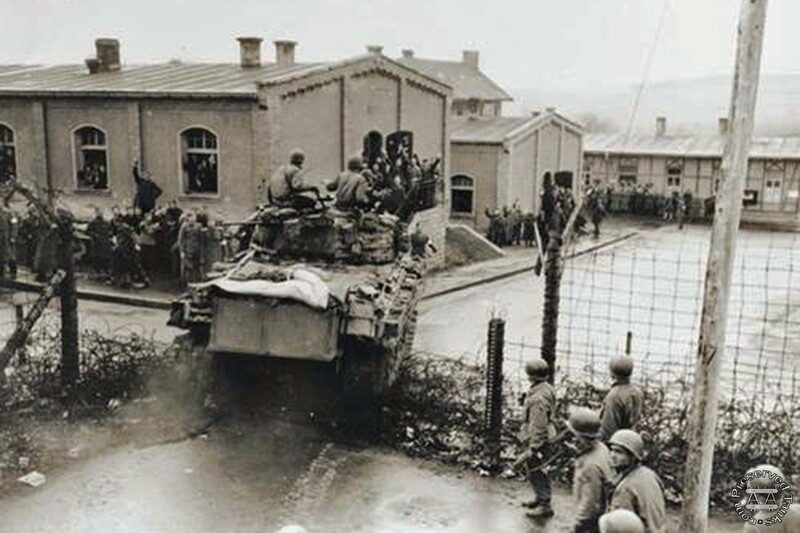 Pool’s luck ran out at the town of Munsterbusch, south of Aachen, Germany, on September 19, 1944, while leading the breakthrough through the Westwall. 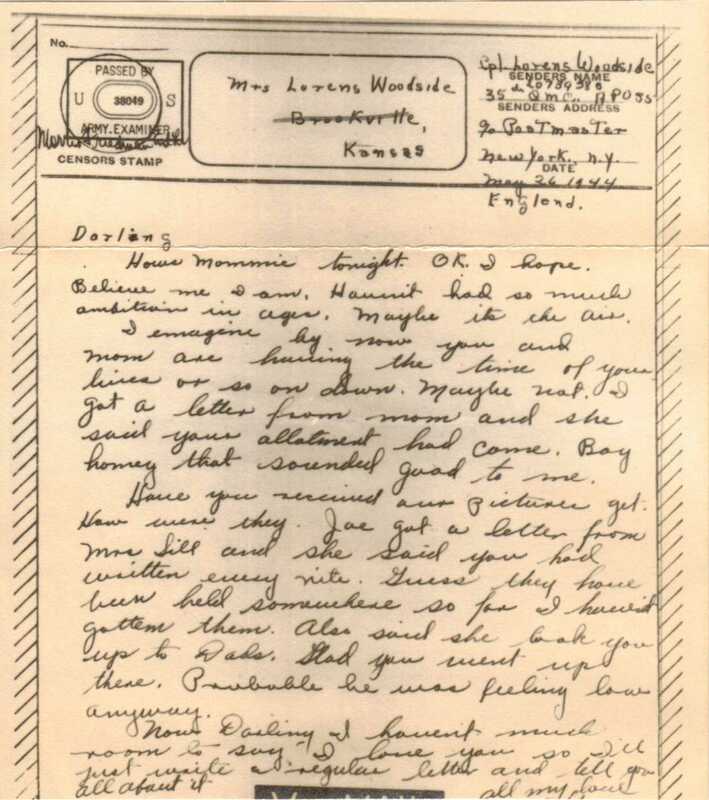 The crew was due to rotate home in a few days for a war bond tour. “In the Mood” was not leading this time but was a flank guard for the task force that day. Pool spotted a heavy anti-tank gun hidden in a house. They had a substitute loader that day as Boggs was sent back for a hearing check-up prior to their rotating to the states. The new guy shoved a round in the breech of the 76mm gun and jammed it. Unable to fire Pool yelled “Back up baby!” as the first shell hit the turret blowing Pool off the tank onto the ground. He landed running and his right leg folded like an accordion. He quickly gave himself a morphine injection, sat down and tried to cut his shattered leg off with his pocket knife. Meanwhile, a second shell hit the tank well forward as Richards backed the tank up slowly. To Richards, Oiler, the loader and Close, there was only the bell sound of the hit, the stench of powder and shower of sparks. Richards didn’t know that Pool had been thrown clear of the turret and kept on backing up. 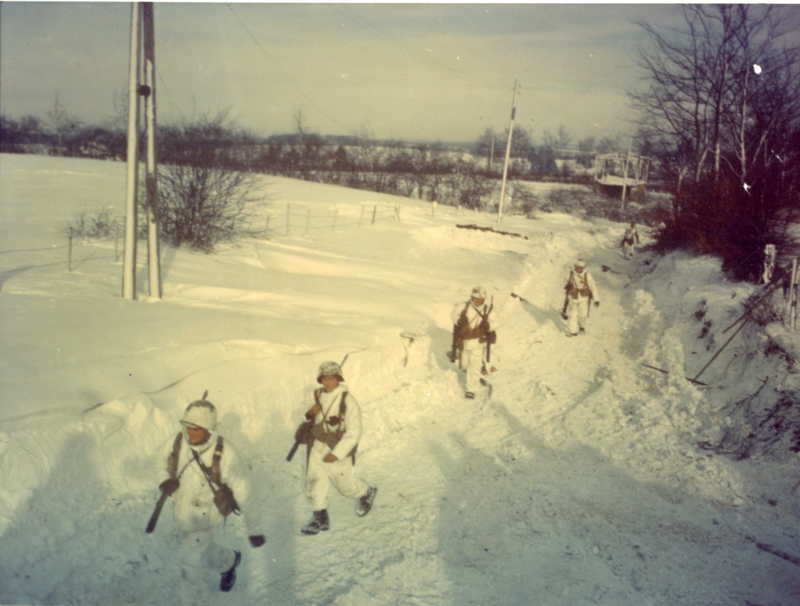 Col. Richardson saw “In the Mood” slowly reach a cut bank and, as if in slow motion, topple over, almost upside down. Oiler felt the blood on his legs and knew that he had been wounded. The others were unhurt and all four crawled out of the overturned tank. The war was over for Lafayette G. Pool. He knew that he and his crew could beat the Germans. He proved it so often that his record is almost an unbelievable document of total victory. The amazing score compiled by the Texan and his crew is fully authenticated by the Third Armored Division. Pool was twice nominated for the Medal of Honor. The first time the papers were lost, the second time it was turned down as the higher-ups felt that it was a crew, not an individual effort. He was awarded the Distinguished Service Cross, Silver Star, Legion of Merit, Purple Heart, French Croix de Guerre, with Bronze Star, Belgium Fourragere, and Order of St. George Medal. Pool’s career was far from over though, but first he had an ordeal that he had to go through with his wounded right leg. After three shots of morphine he awoke nineteen days later in a hospital in Belgium. Due to rain and exposure, he contracted double pneumonia. 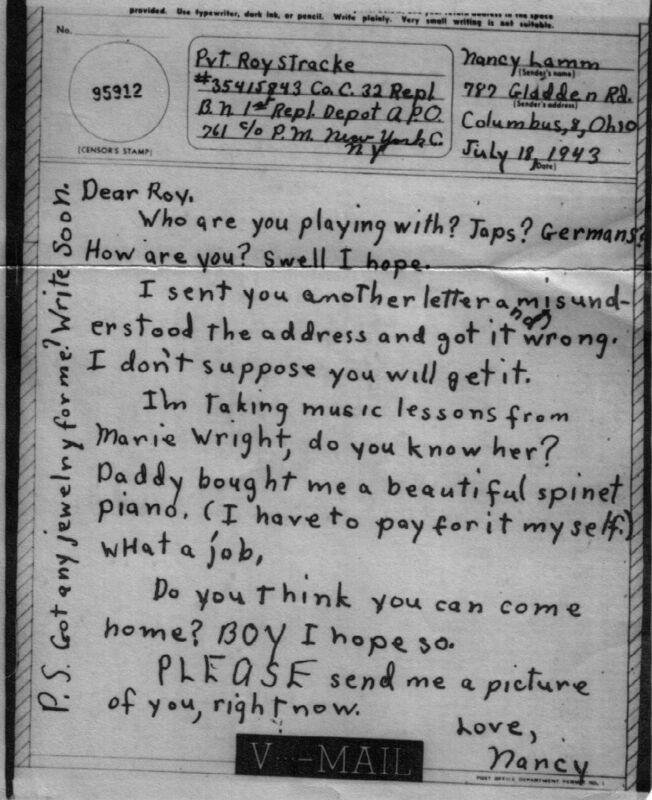 He did not get back to the states until January, 1945. When he was wounded he weighed 196 pounds and when he returned to the United States he weighed 85 pounds! The bone in his leg from the knee to the ankle was gone but his toenail would still grow, so doctors hesitated to amputate. 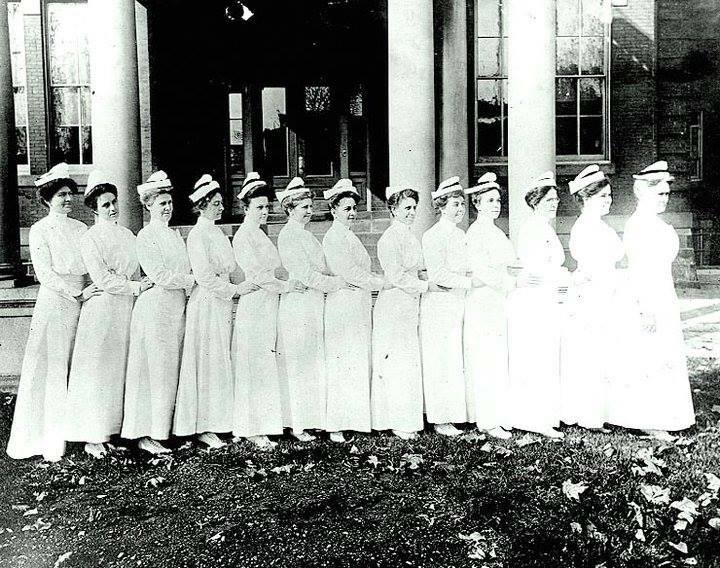 Later they amputated it eight inches above the knee at Temple, Texas Army Hospital. He was discharged in June of 1946, and went home with an artificial leg, later to farm and run a gas station. In 1948 he was called back to active duty along with seven other amputees because of their technical skills as specialists. He returned as a staff sergeant and taught tank mechanics as a master mechanic. 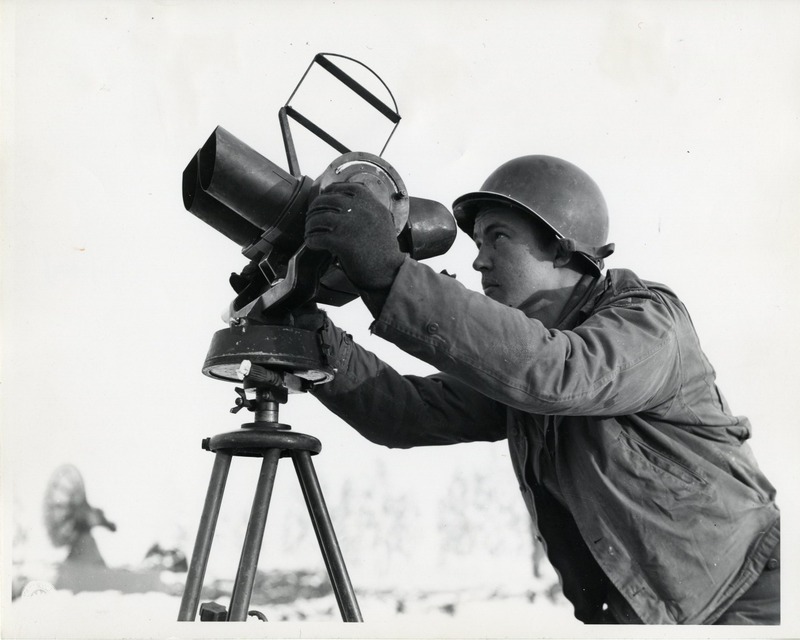 After a promotion to Warrant Officer in 1952, he worked as an ordnance inspector. He was classified as “Z.I.” (no duty out of zone of interior). Pool retired from the Army as a Chief Warrant Officer Second Class, at Ft. Sam Houston, Texas on September 19,1960. Afterwards he went to business college, followed by a job as a preacher for $25.00 a week. He also coached little league. Desert Storm found the 3-32 Armor in the thick of battle against the Iraqi Armor. 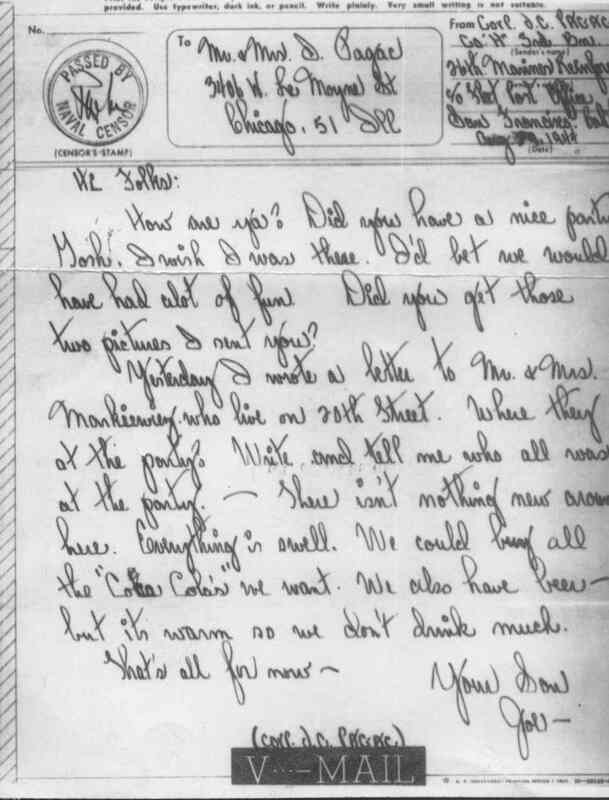 Lafayette was in a hospital bed, very ill, but he watched the war constantly on television, fretting and worrying about “his boys.” When the fighting had ceased, he kept asking his wife Evelyn, “Honey, are my boys back yet?” When they finally got back to Fort Hood, Evelyn told him they were back and soon after this on May 30,1991, Pool passed away in his sleep. Pool was survived by his wife Evelyn, three sons and four daughters. One other son, Capt. Jerry L. Pool, was missing in action in Cambodia in 1970. Before his death the Army decided to name its new Ml tank driver training simulator facility after Pool, even waving the fact that he was still alive. Dedicated on July 1, 1993, today the facility at Ft. Knox serves to train new tank drivers to drive the Ml series of tanks. At present the facility has ten systems of two simulators each. One system has been converted to Ml AR configuration. The authors were able to try out a simulator, thanks to Irene Armstrong – secretary of protocol, and found it an excellent approach to learning to drive. The savings in fuel, thrown tracks, and wear and tear, plus damage to the real tanks is tremendous, and it will more than pay for its initial cost. Each new tanker is given twelve hours of training before he transitions into the real thing. Scenarios can be varied from desert and arctic terrain to urban driving. 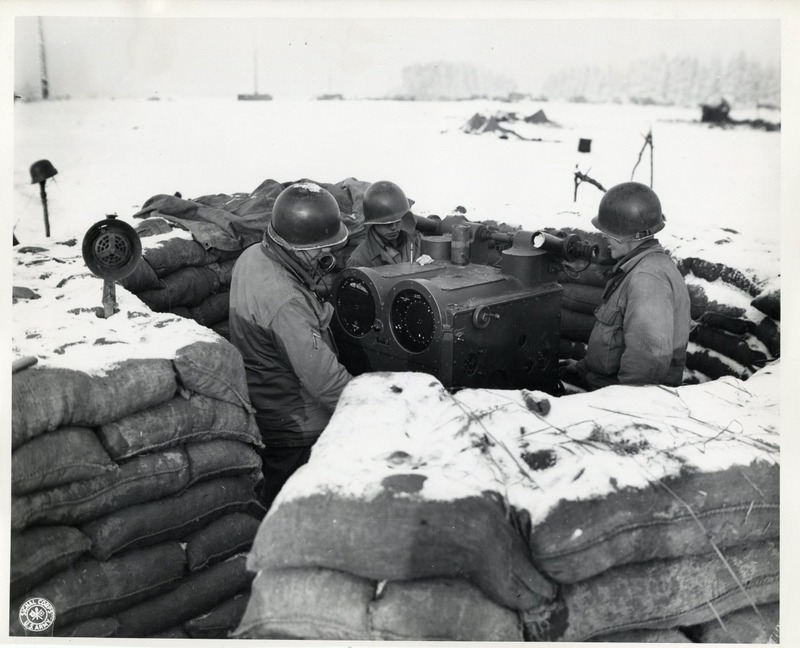 Weather can vary, artillery fire can be received, the tank’s main gun can be fired by the controller, plus night or day time driving with open hatches or closed down on periscopes. All these things make this simulator the closest thing to actual driving a real tank to date. Our controller, SFC Byrd, said the simulator is much more difficult than actually driving the “real” M1. Today Lafayette G. Pool is remembered not only as our top tank ace but also as a man who believed in training hard and doing the job right the first time, as there may not be a second time in modem warfare. The film was shot in England in large part due to the availability of working World War II-era tanks. The film featured Tiger 131, the last surviving operational Tiger I. The tank belongs to Bovington Tank Museum at Bovington, England. It is the first time since the 1946 film Theirs Is the Glory that a real Tiger tank – and not a prop version – has been used on a film set. 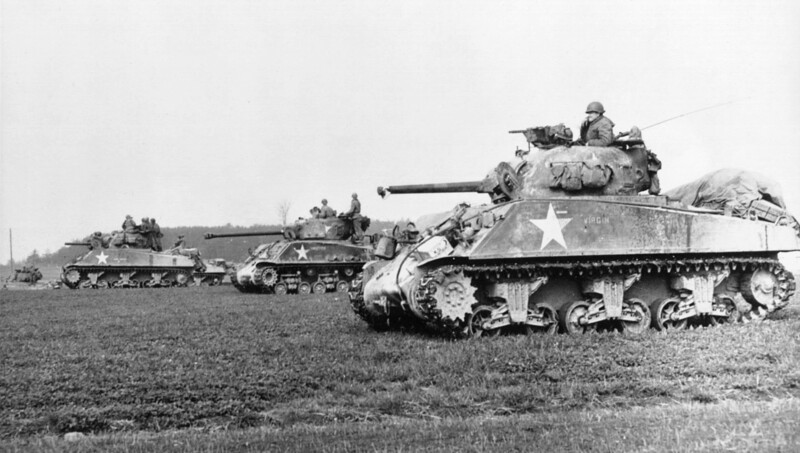 Ten working M4 Sherman tanks were used. The Sherman tank Fury was played by an M4A2E8 Sherman tank named Ben/Harry (T224875), also loaned by Bovington Tank Museum. 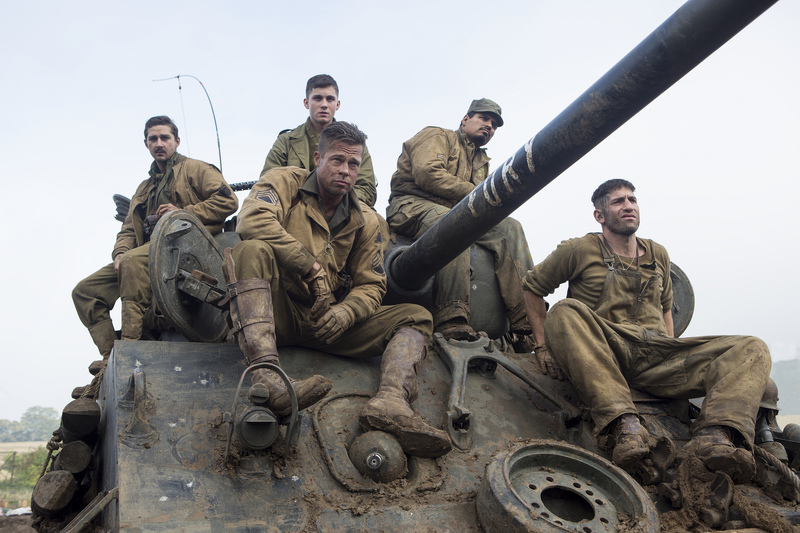 While the plot of the film is fictional, the depiction of the tank Fury and its commander Wardaddy parallels the experience of several real Allied tankers, just like Staff Sergeant Lafayette G. Pool who landed just after D-Day. The small number of Sherman tanks to survive from the landing at D-Day to the end of the war, such as Bomb, a Sherman tank that landed at D-Day and survived into bitter fighting in Germany at the war’s end, the only Canadian Sherman tank to survive the fighting from D-Day to VE Day. Killeen Herald: vol. 35 #113. 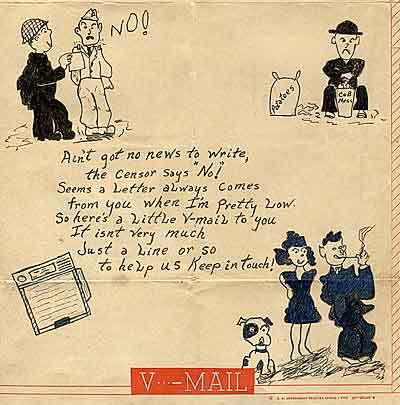 Yank, the Army Weekly written during WWII. Turret (Ft. Knox newspaper); November 21, 1991. Tribune Herald Tuesday: May 5,1987. Pool Hall; Ft. Knox, Kentucky. Building for Driver Training Simulator, Oct. 5,1988. 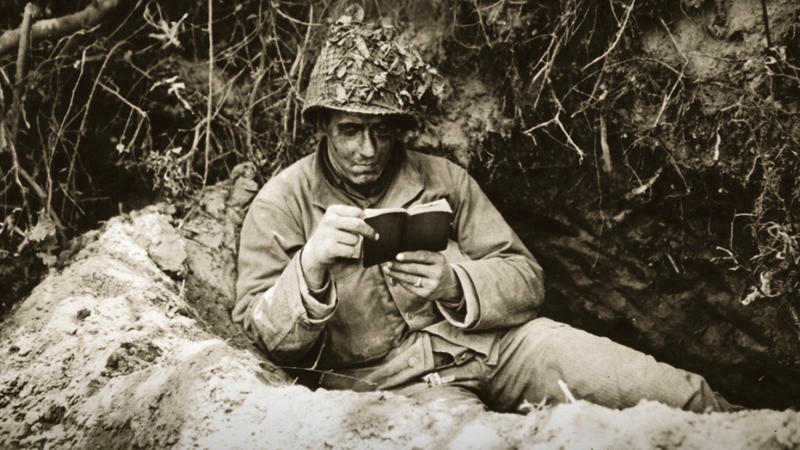 When the American armed forces prepared for the D-Day assault, the most in demand item was a book. 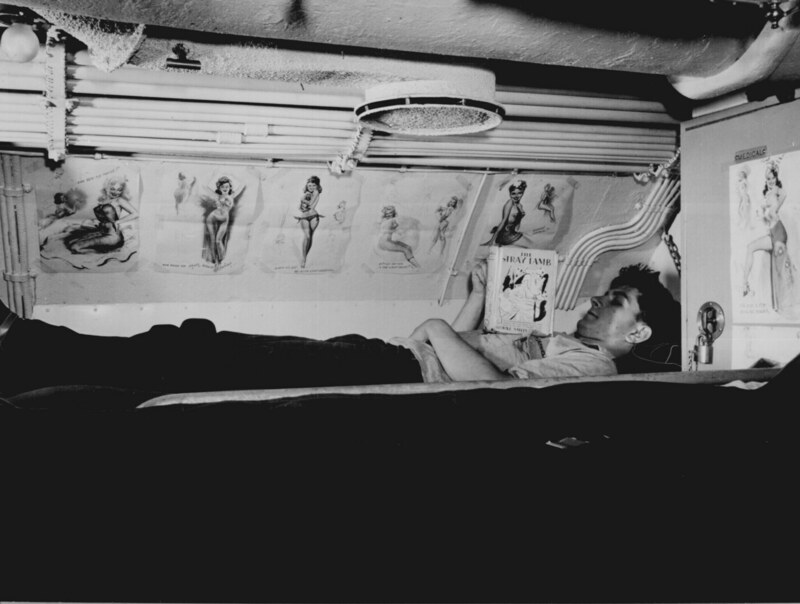 Sailor reading in his bunk aboard USS CAPELIN. 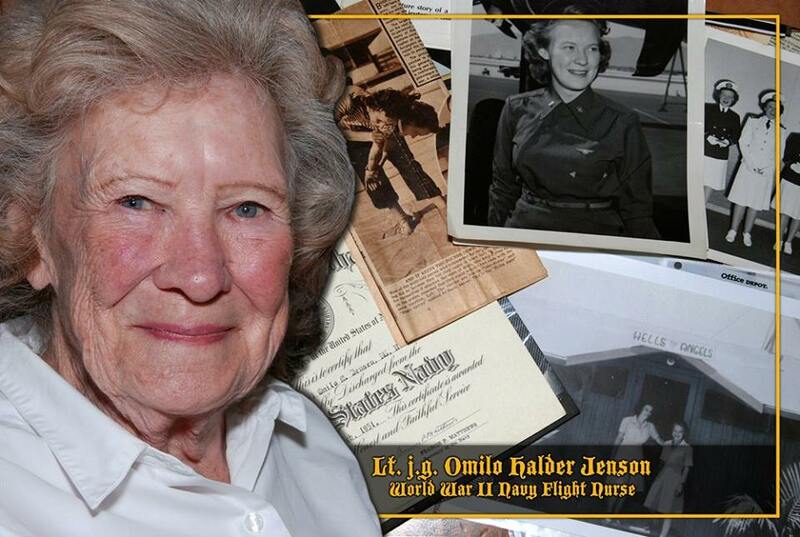 The Americans who landed at Utah and Omaha Beaches on June 6 had vastly different experiences. 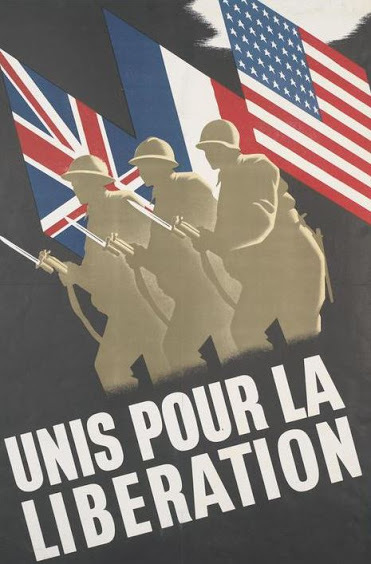 The American Fourth Division poured ashore at Utah Beach, meeting very little opposition. 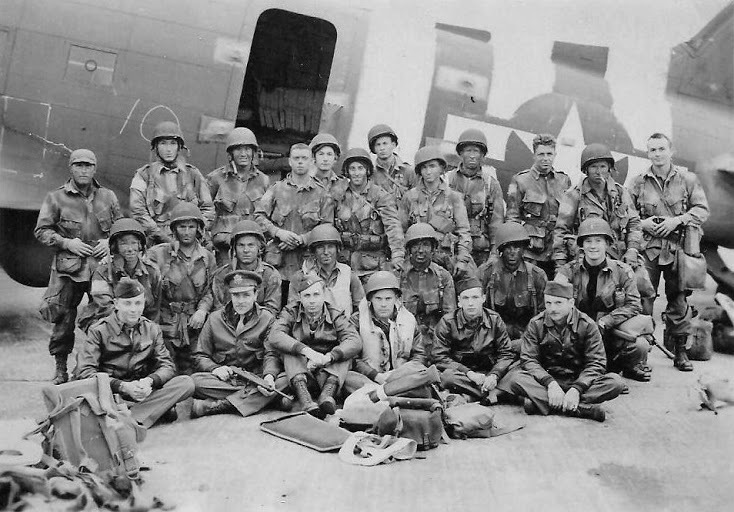 In fact, some men were a little let down at how anticlimactic the landing was; they described it as seeming like just another practice invasion. 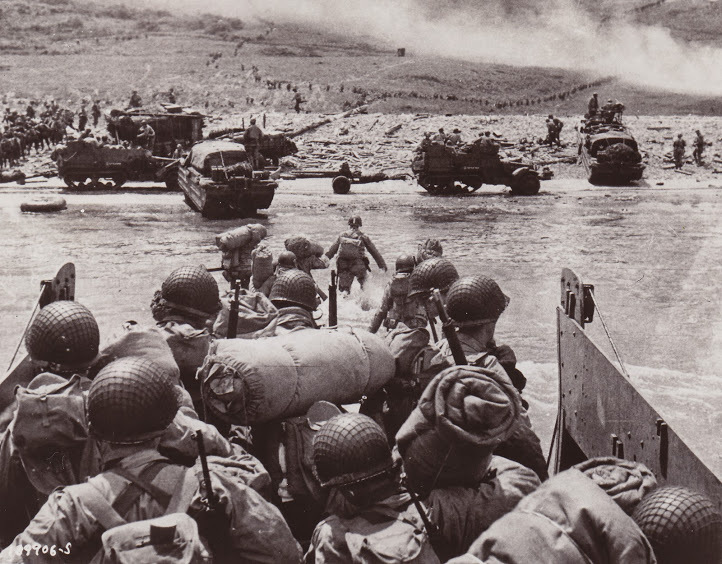 The early waves of troops landing at Omaha Beach, by contrast, faced near-certain death. As soon as the transports lowered their ramps, the exiting men were thrust into the line of fire. German machine-gun spray ripped across the boats, instantly killing the hapless Americans on them. For the first wave of LCIs that reached Omaha Beach, the death rate was nearly 100 percent; no one got off the beach. Later waves of troops faced grievous losses on the shore. 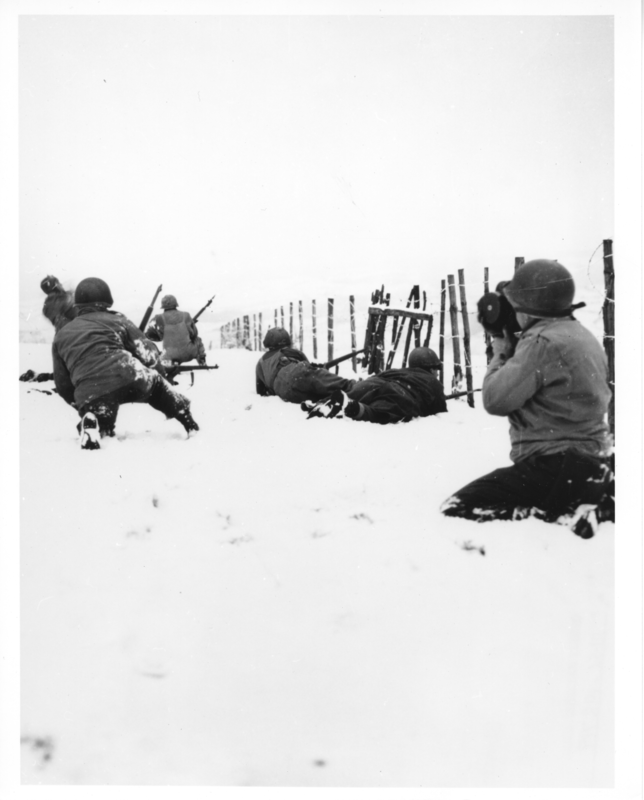 Shell-shocked, many men simply froze, unable to move toward safety. 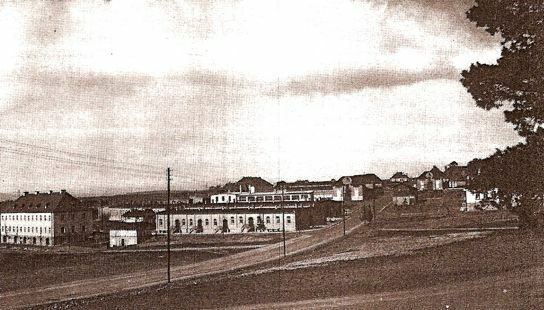 Others who forded through the barrage of gunfire and mortar blasts and moved to the shelter of the cliffs at the top of the beach suffered injuries along the way. Unable to go farther, their shattered bodies dropped to the sand and stayed there until medics arrived. 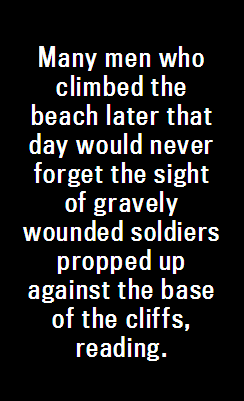 Many men who climbed the beach later that day would never forget the sight of gravely wounded soldiers propped up against the base of the cliffs, reading. 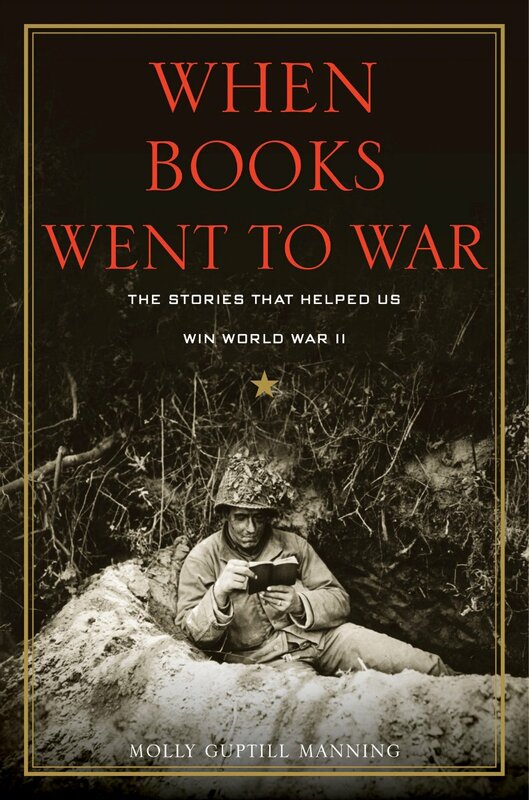 Excerpted from When Books Went to War: The Stories That Helped Us Win World War II by Molly Guptill Manning. Copyright © 2014 by Molly Guptill Manning. Used by permission of Houghton Mifflin Harcourt Publishing Company. All rights reserved. 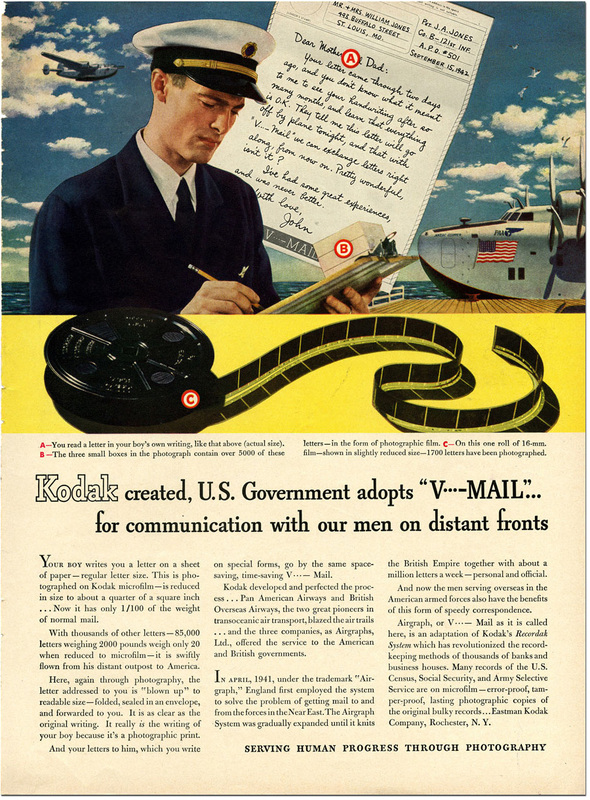 V-mail, or Victory mail, was a valuable tool for the military during World War II. The process, which originated in England, was the microfilming of specially designed letter sheets. 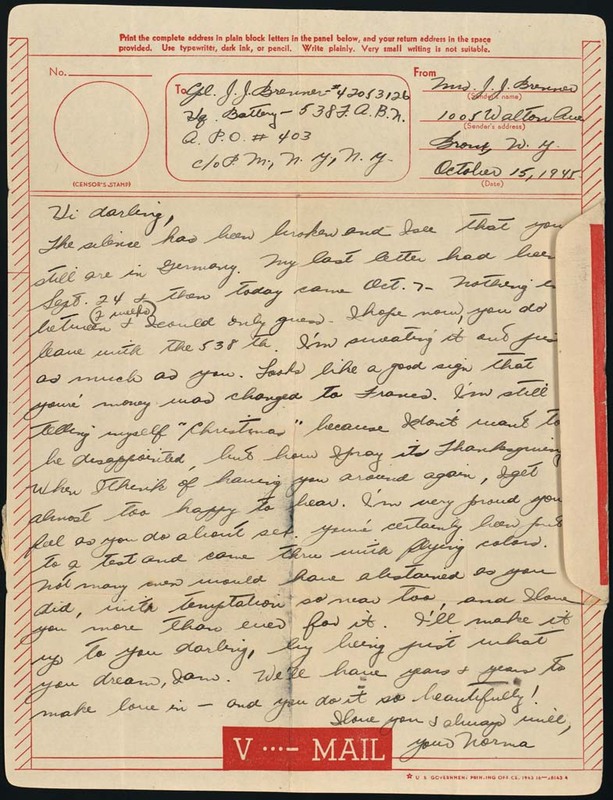 Instead of using valuable cargo space to ship whole letters overseas, microfilmed copies were sent in their stead and then “blown up” at an overseas destination before being delivered to military personnel. 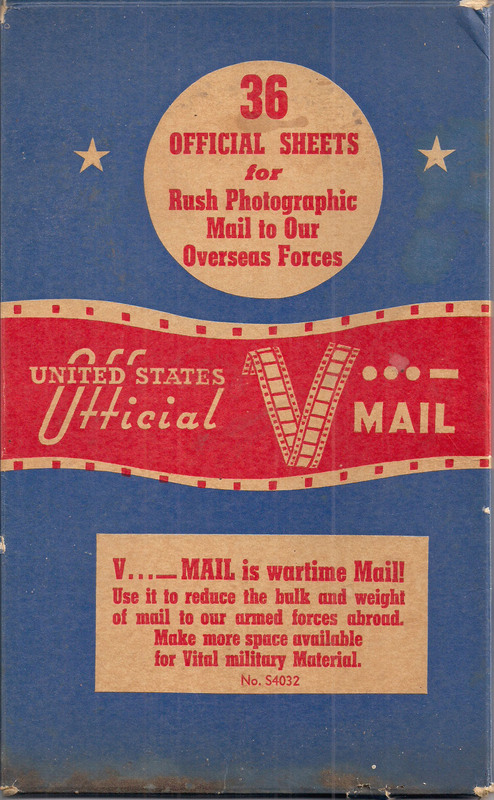 V-mail ensured that thousands of tons of shipping space could be reserved for war materials. The 37 mail bags required to carry 150,000 one-page letters could be replaced by a single mail sack. The weight of that same amount of mail was reduced dramatically from 2,575 pounds to a mere 45. 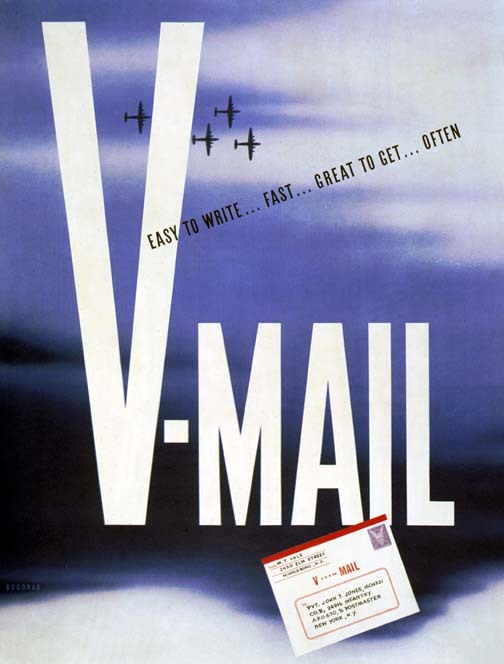 The blue-striped cardboard containers held V-mail letter forms. The system of microfilming letters was based on the use of special V-mail letter-sheets, which were a combination of letter and envelope. 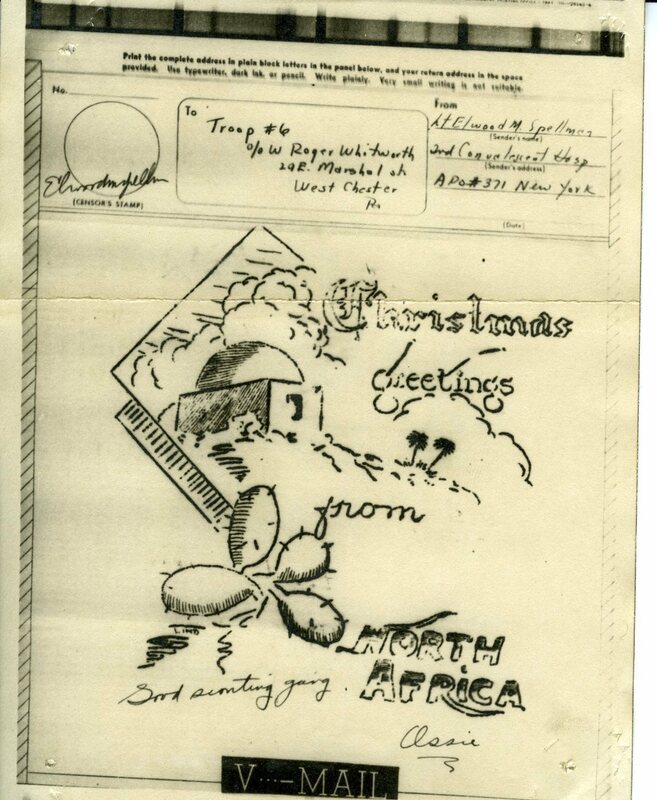 The letter-sheets were constructed and gummed so as to fold into a uniform and distinctively marked envelope. 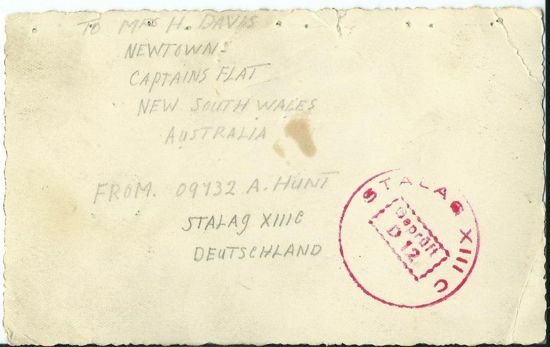 The user wrote the message in the limited space provided, added the name and address of the recipient, folded the form, affixed postage, if necessary, and mailed the letter. 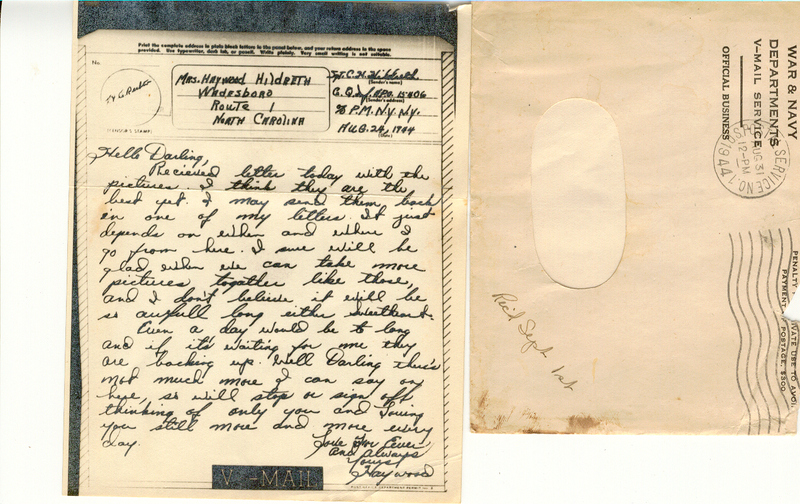 V-mail correspondence was then reduced to thumb-nail size on microfilm. 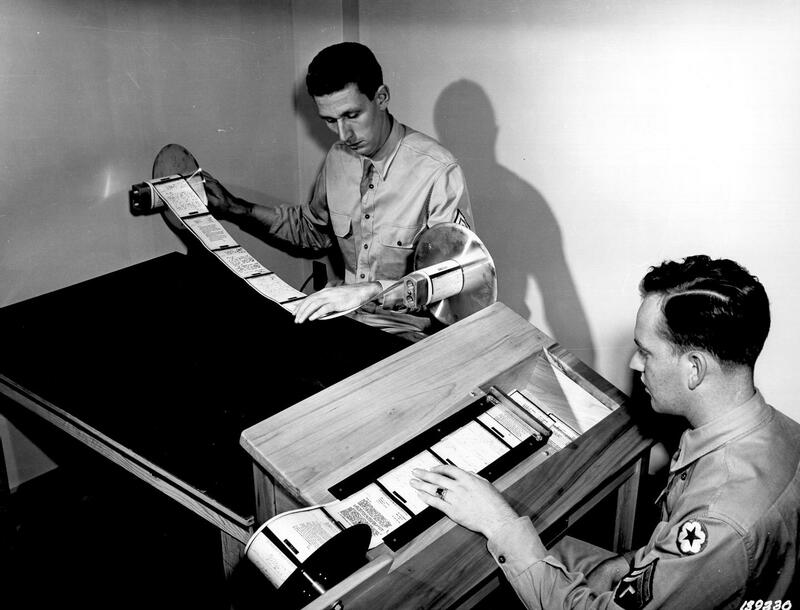 The rolls of film were sent to prescribed destinations for developing at a receiving station near the addressee. Finally, individual facsimiles of the letter-sheets were reproduced about one-quarter the original size and the miniature mail was then delivered to the addressee. 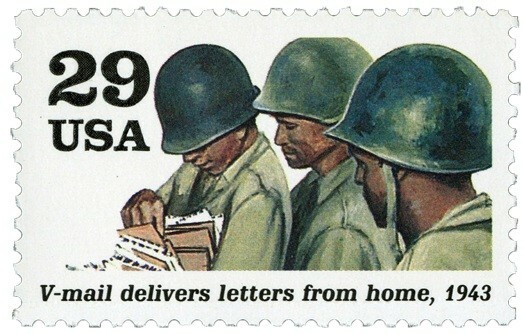 The first large Army operated V-mail station overseas was opened on April 15, 1943 at Casablanca, North Africa. Hastily set up in a field following the Allied invasion of North Africa, this makeshift station continued to operate until September 15, 1943. 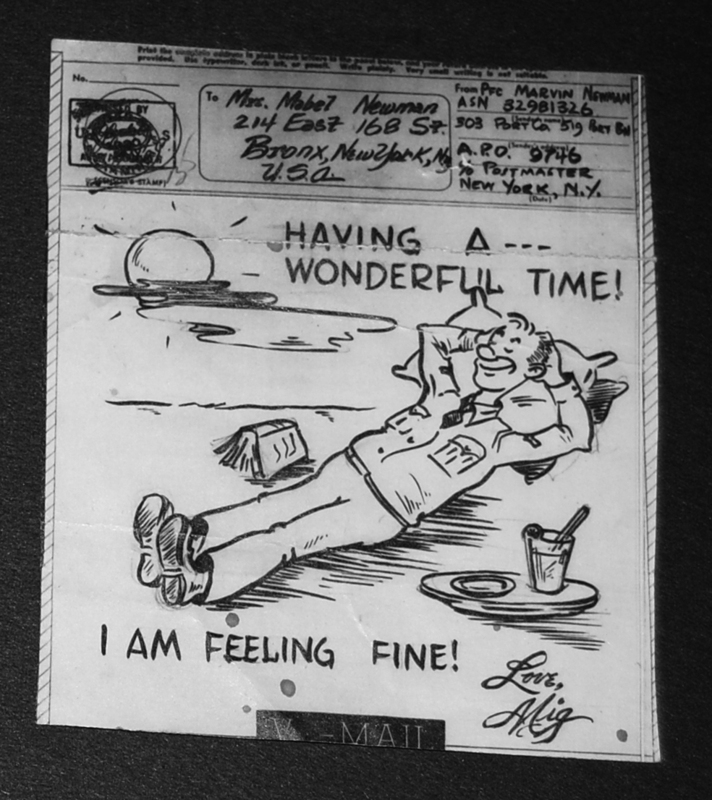 The science of V-mail, 1940s on microfilm. 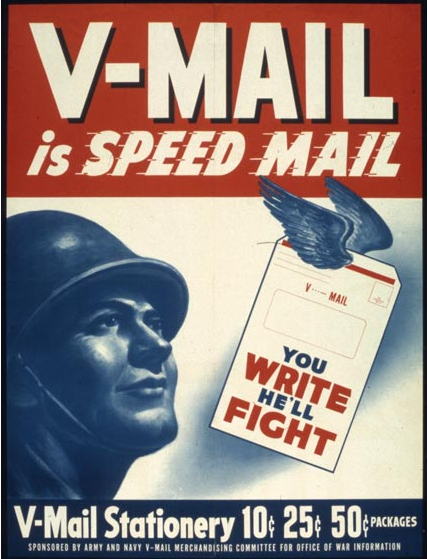 Between June 15, 1942 and April 1, 1945, 556,513,795 pieces of V-mail were sent from the U.S. to military post offices and over 510 million pieces were received from military personnel abroad. 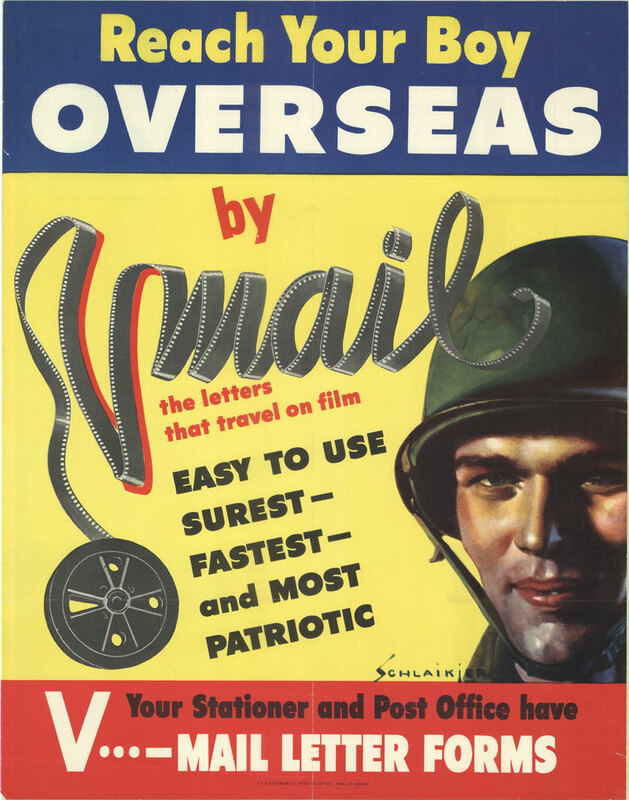 In spite of the patriotic draw of V-mail, most people still sent regular first class mail. 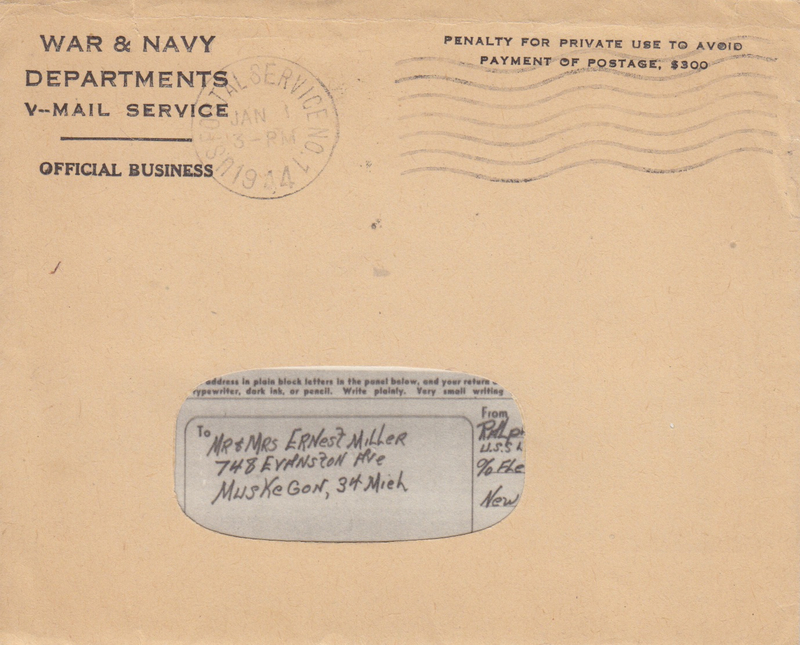 In 1944, for instance, Navy personnel received 38 million pieces of V-mail, but over 272 million pieces of regular first class mail.